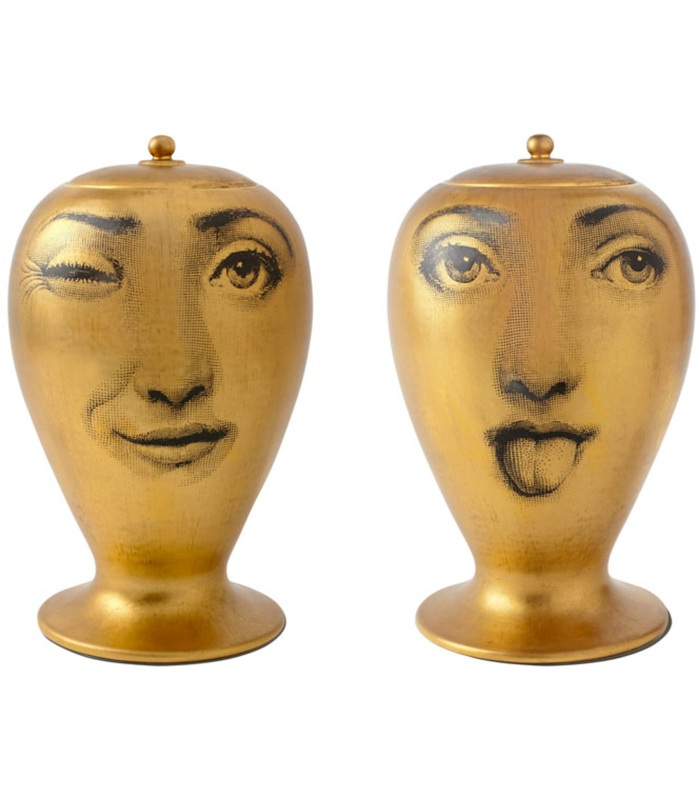 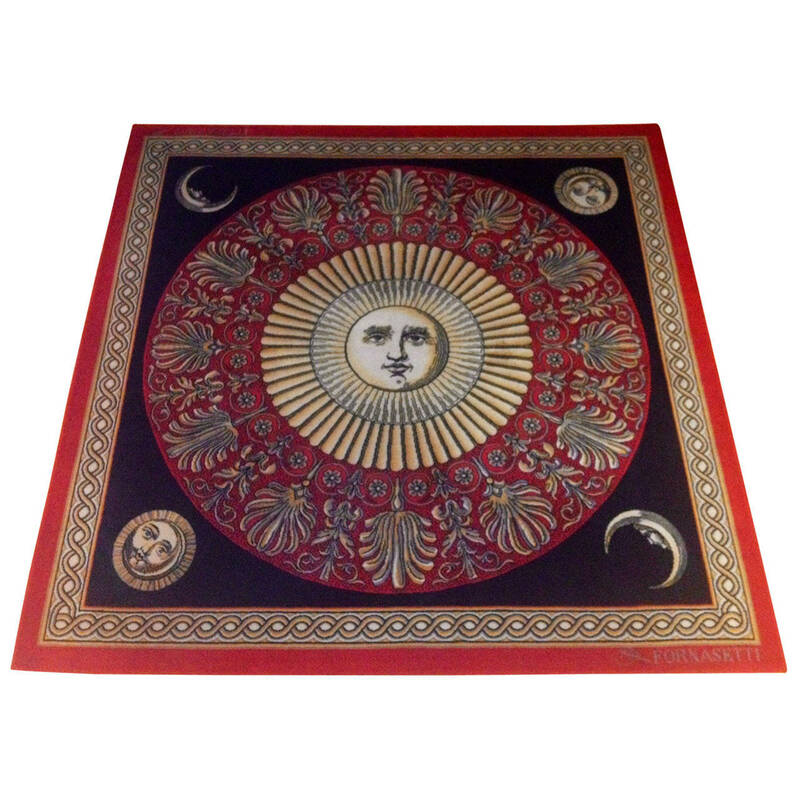 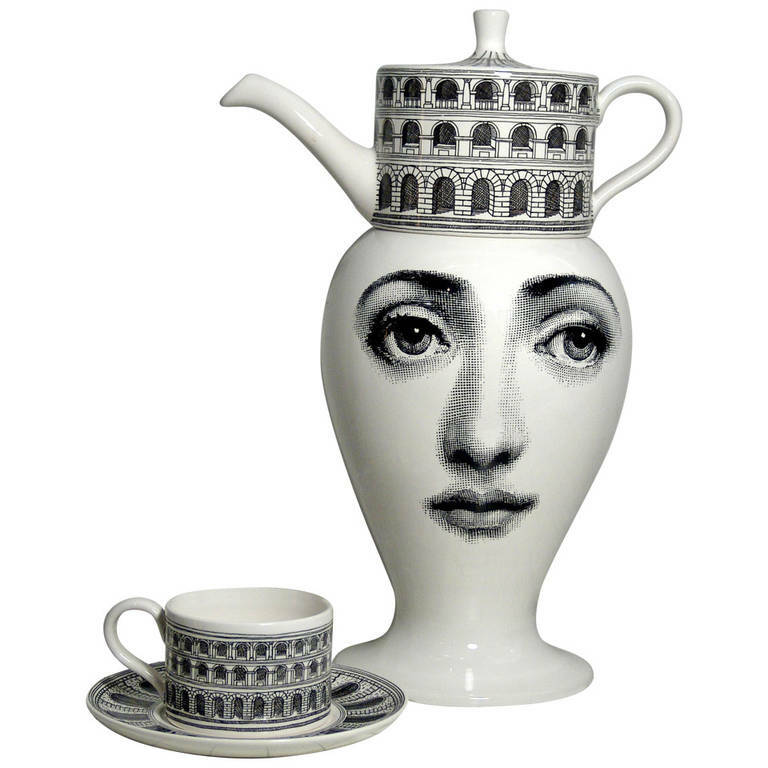 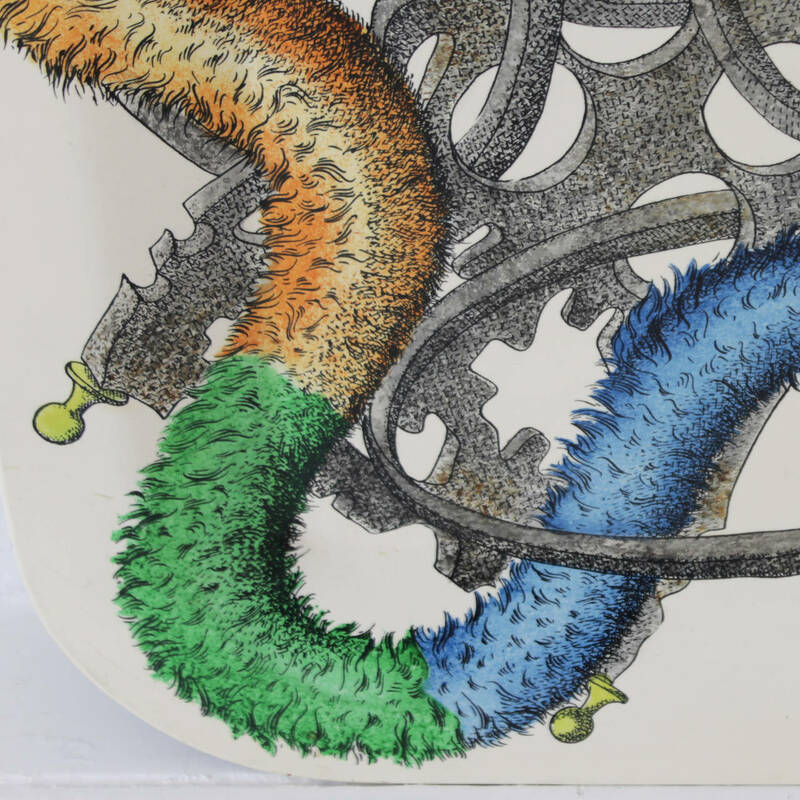 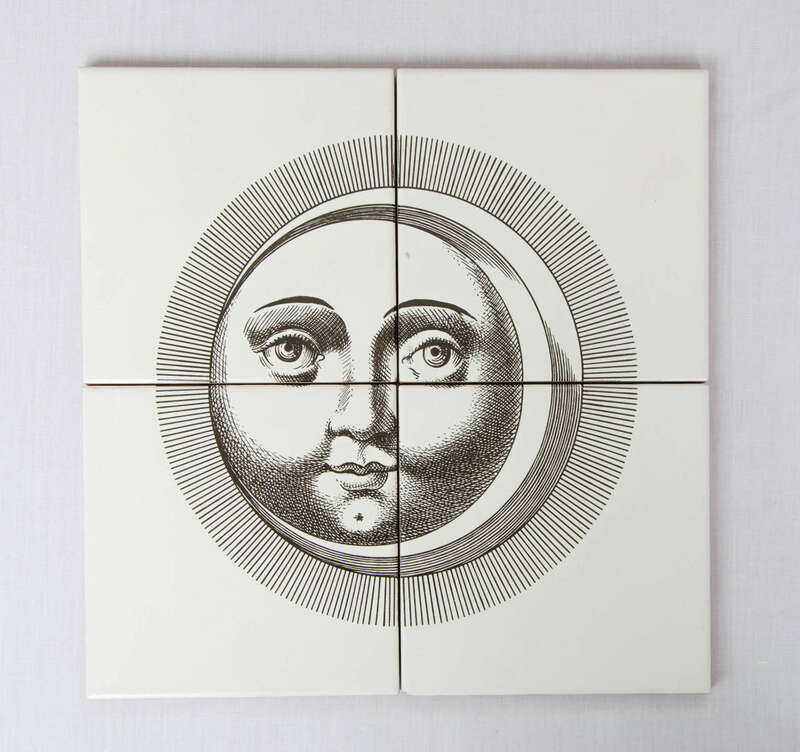 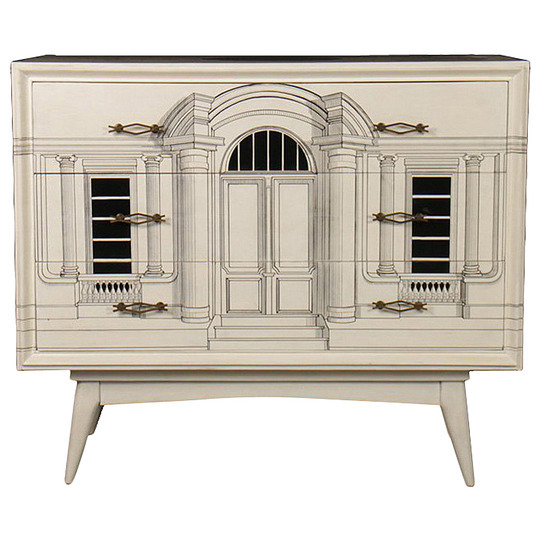 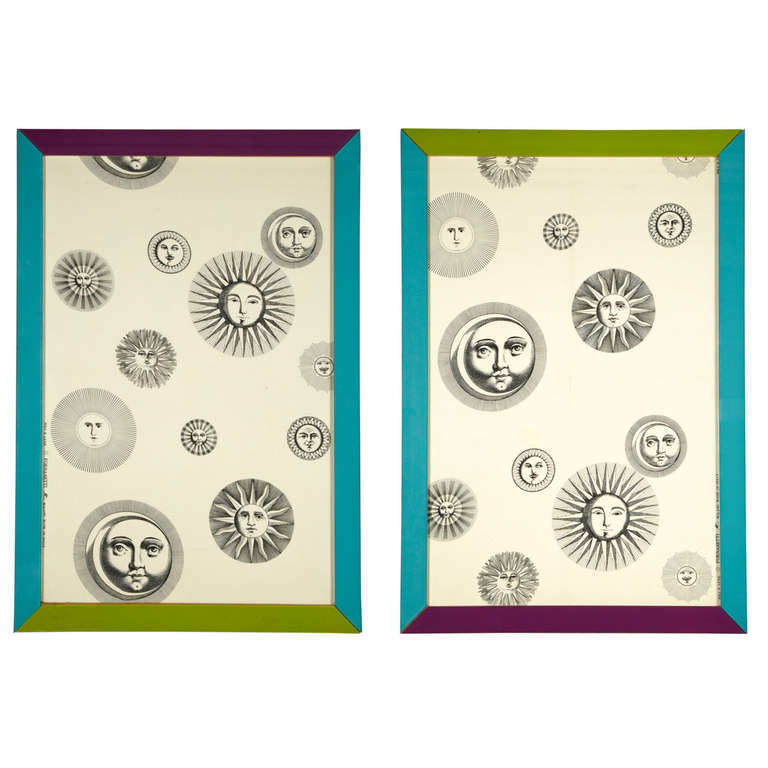 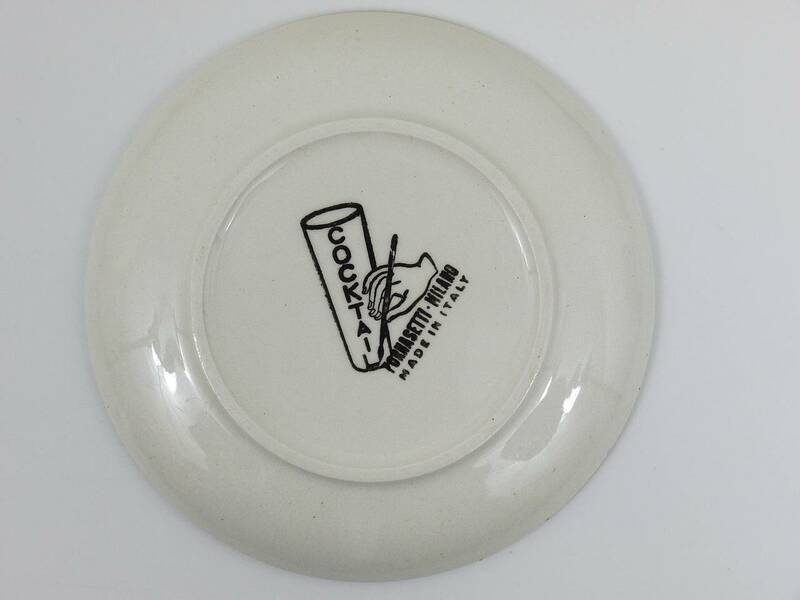 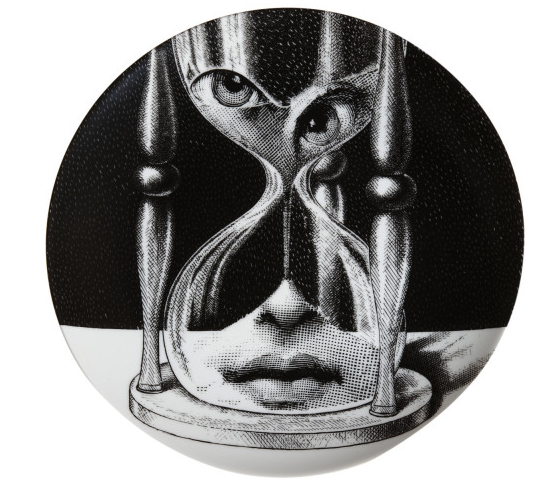 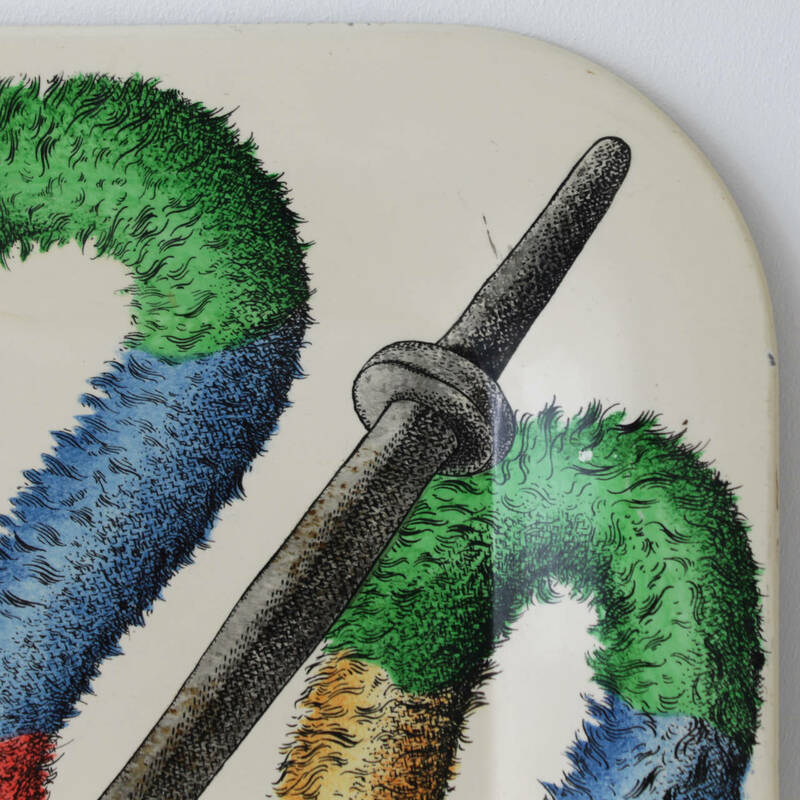 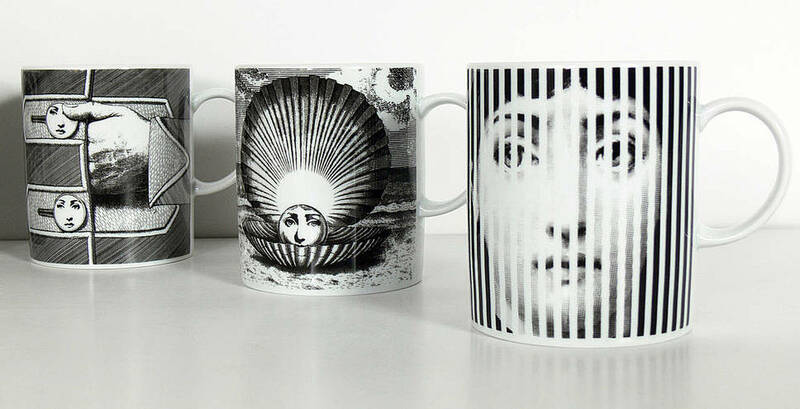 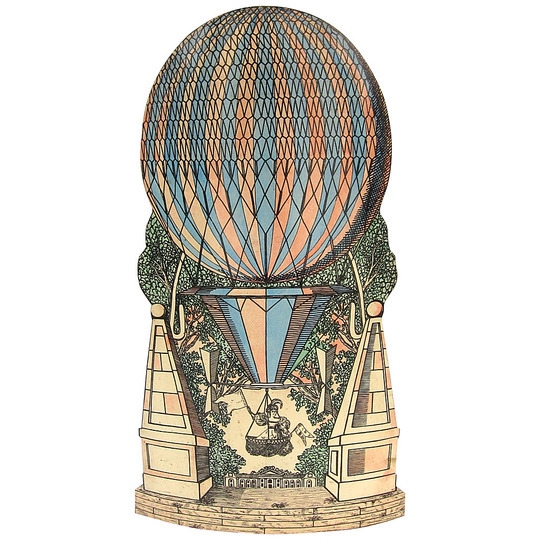 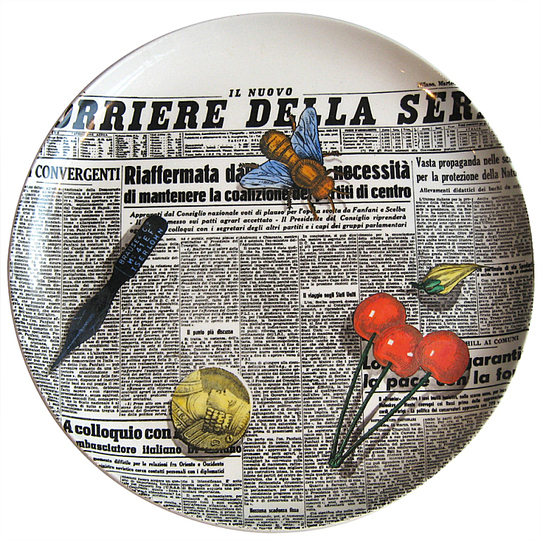 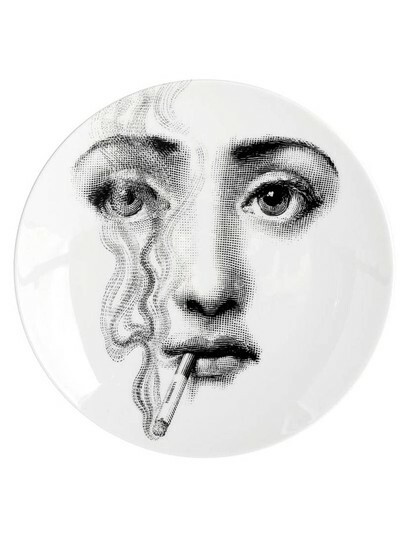 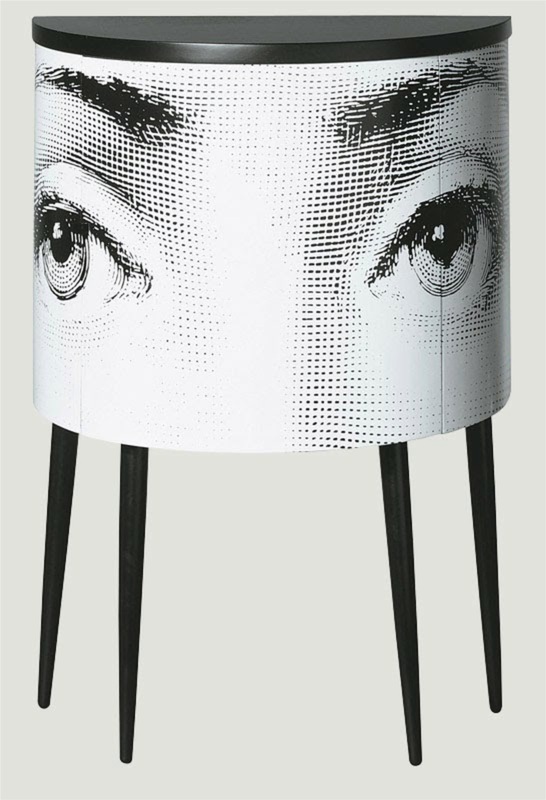 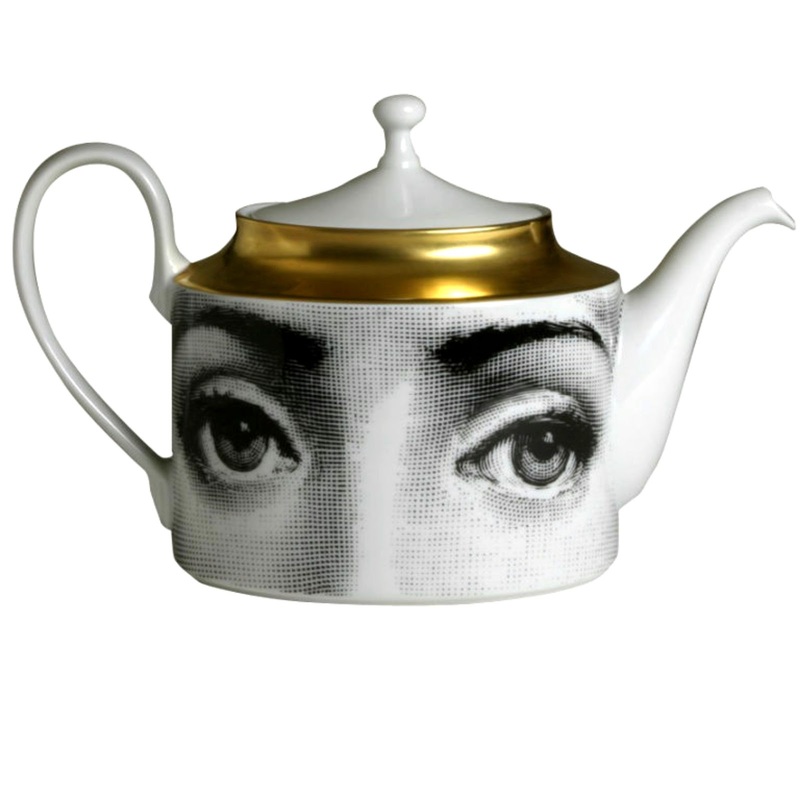 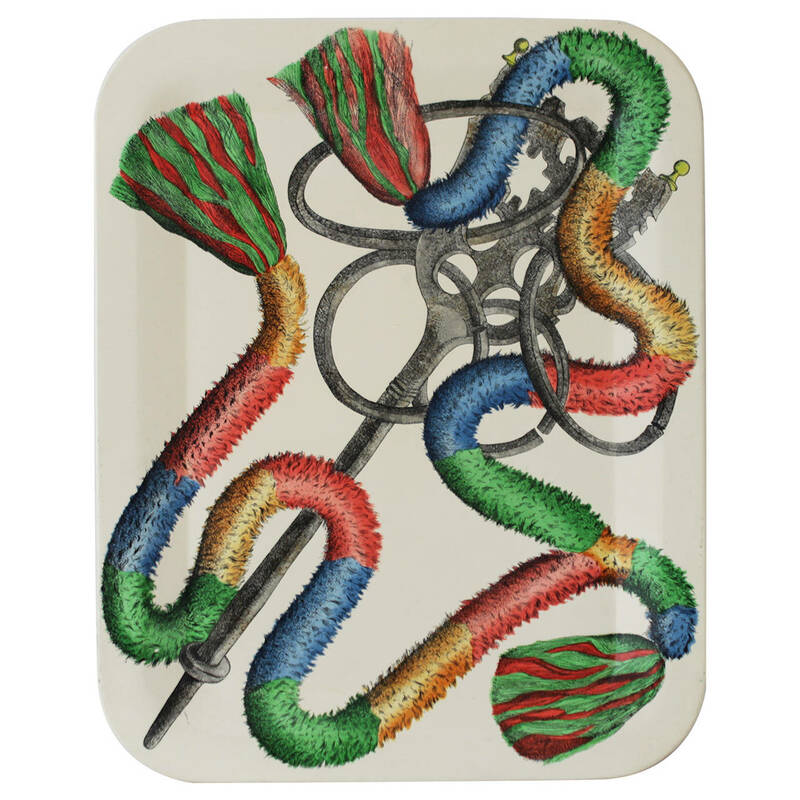 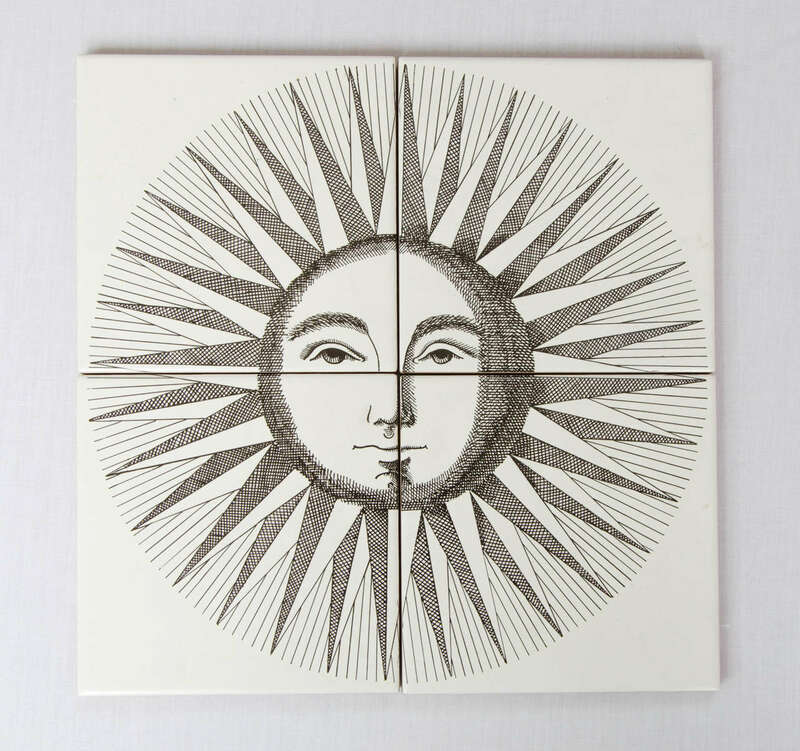 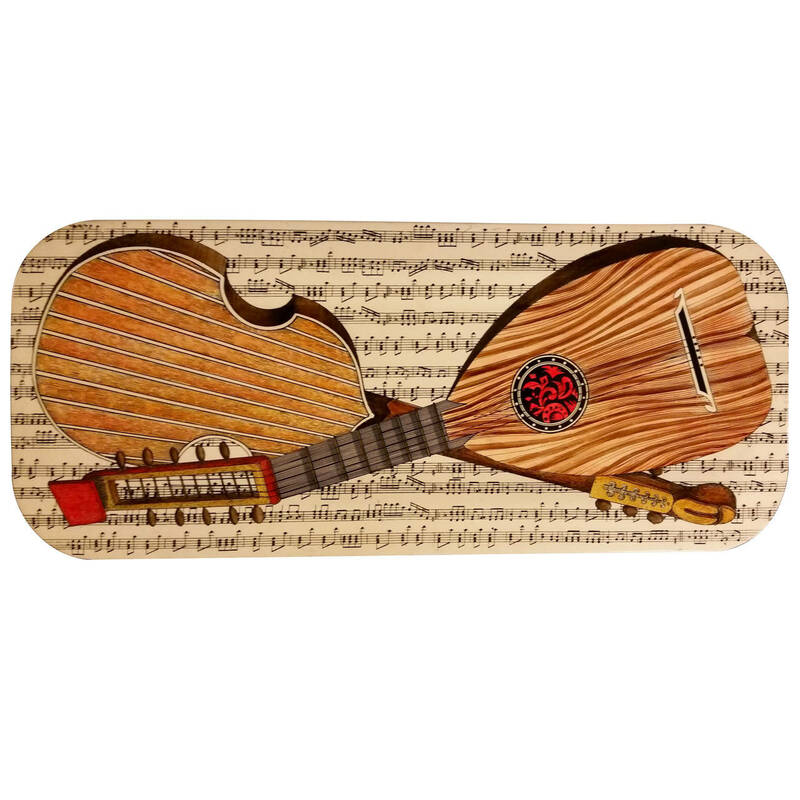 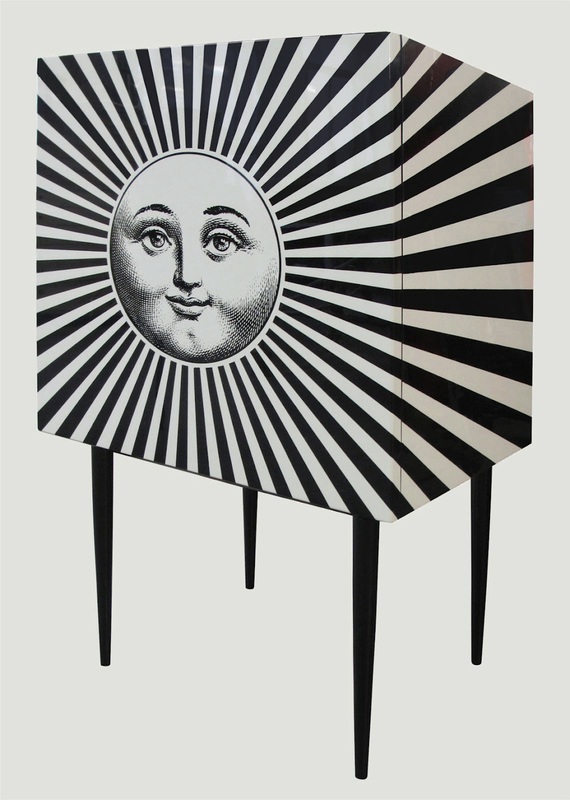 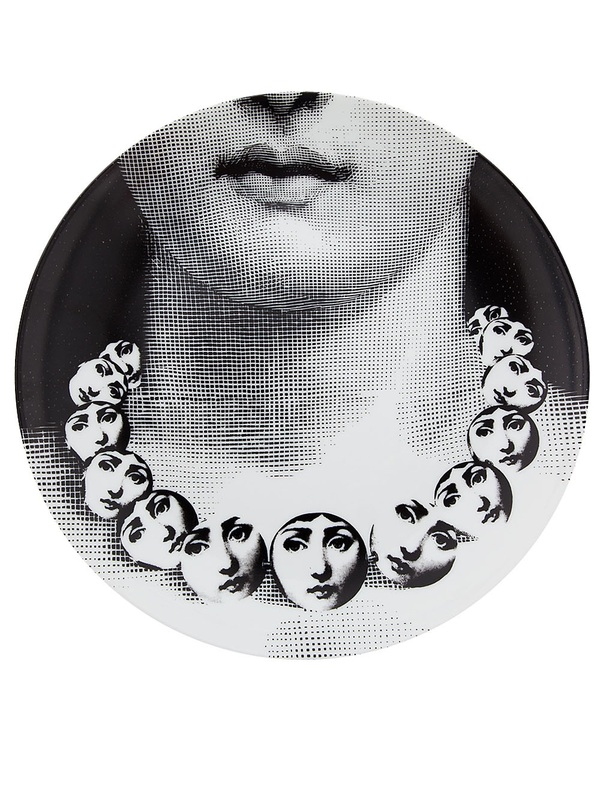 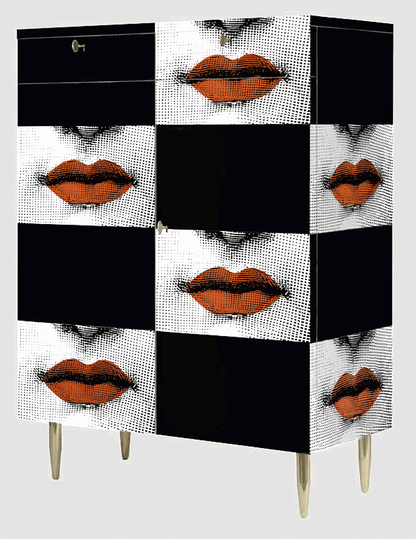 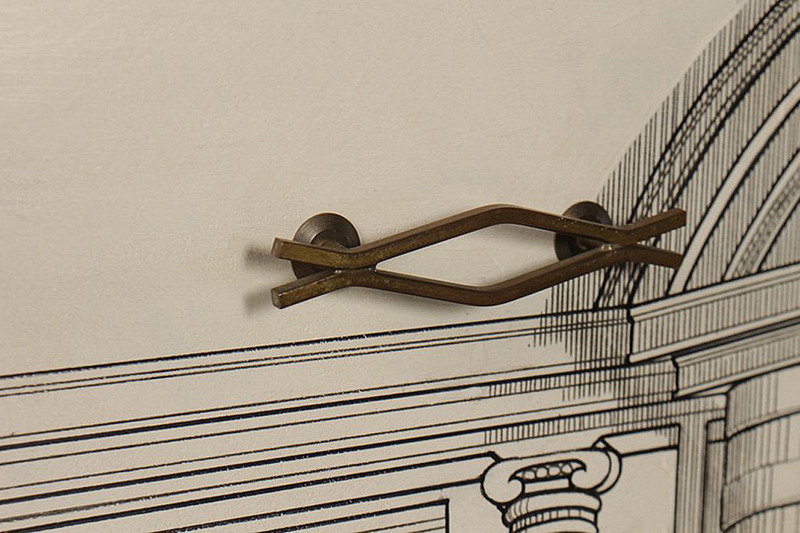 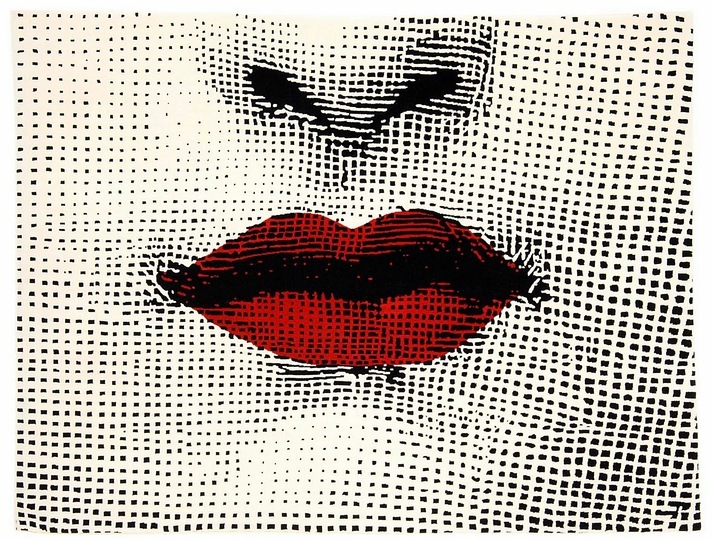 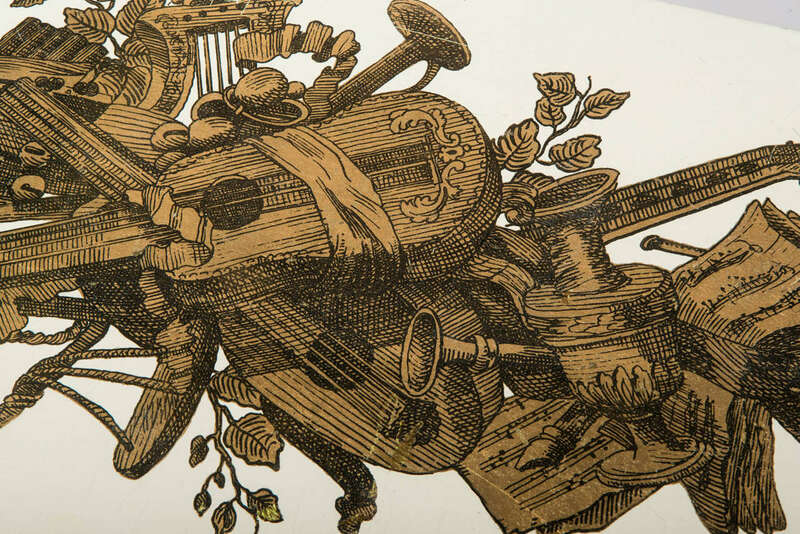 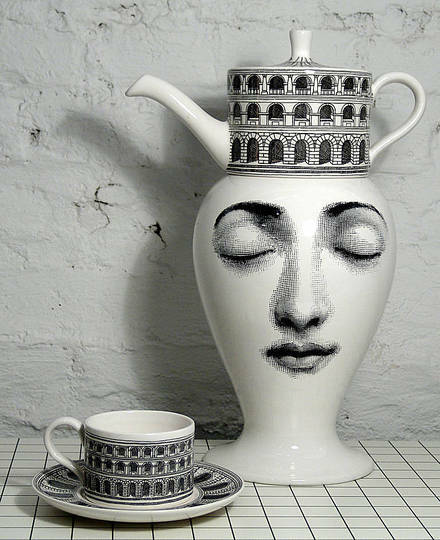 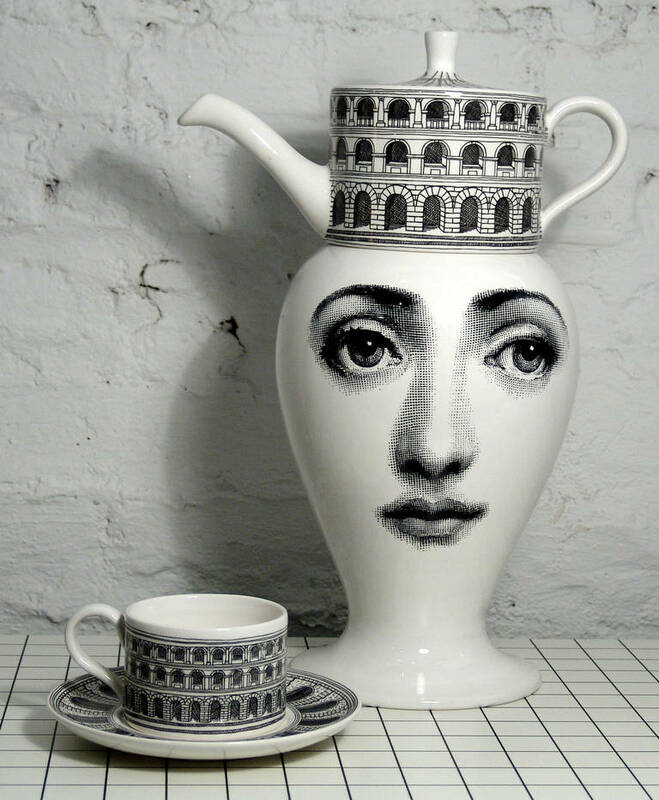 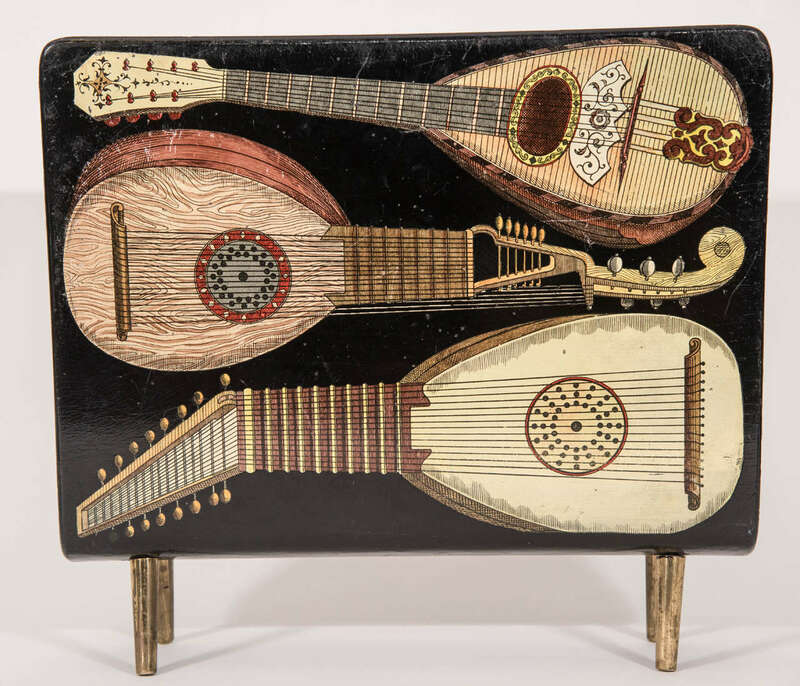 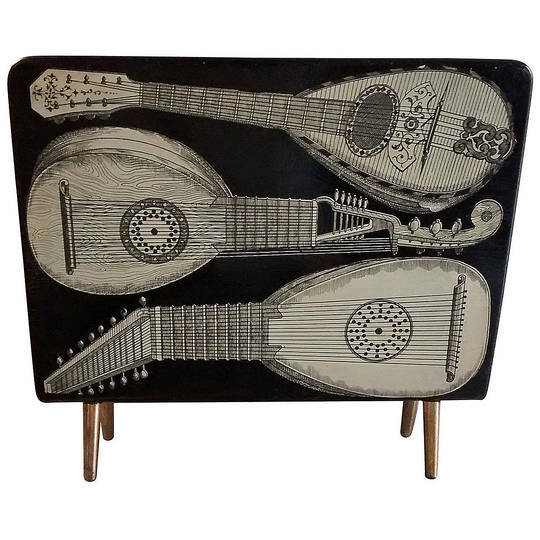 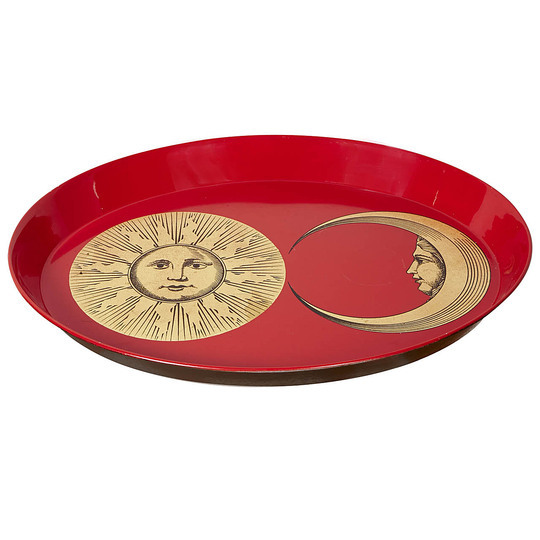 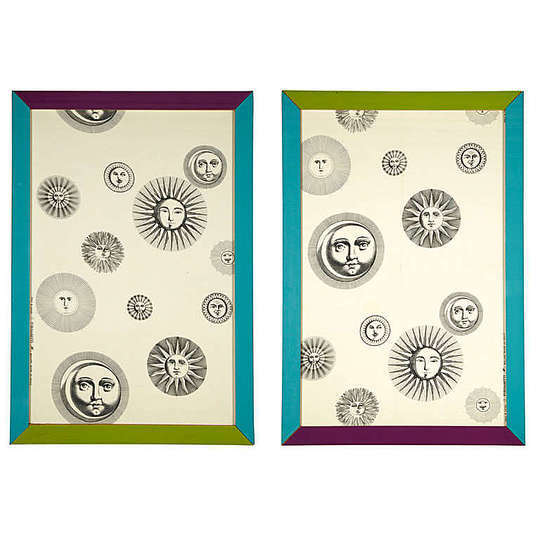 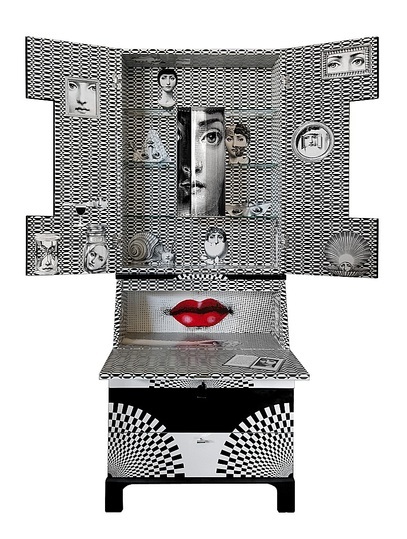 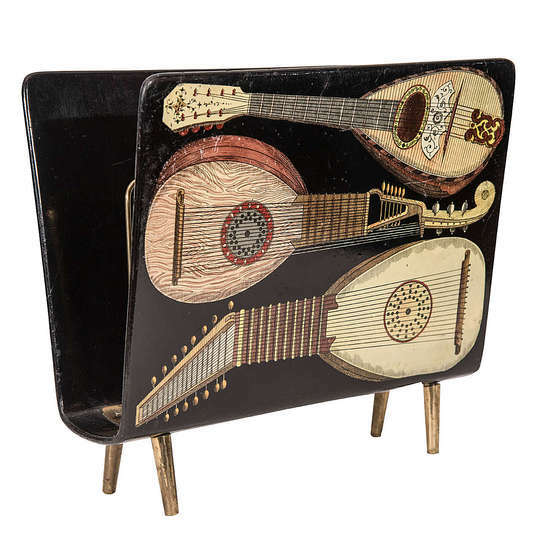 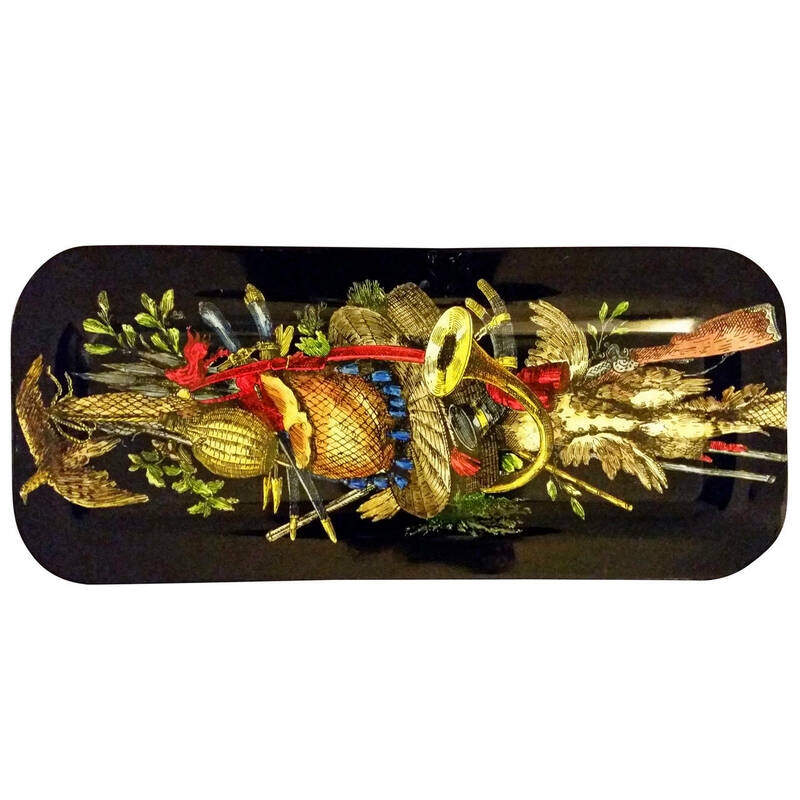 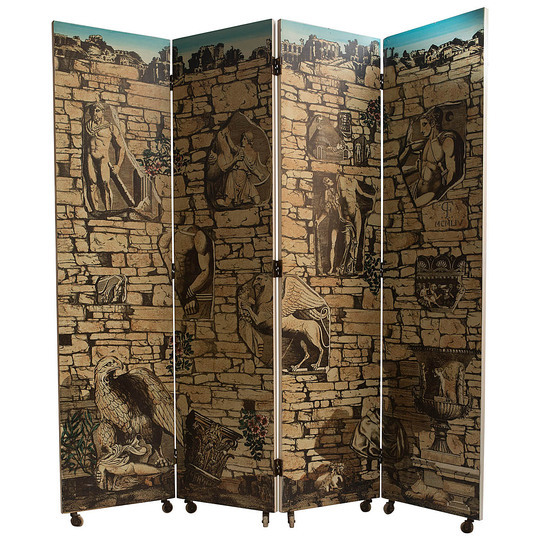 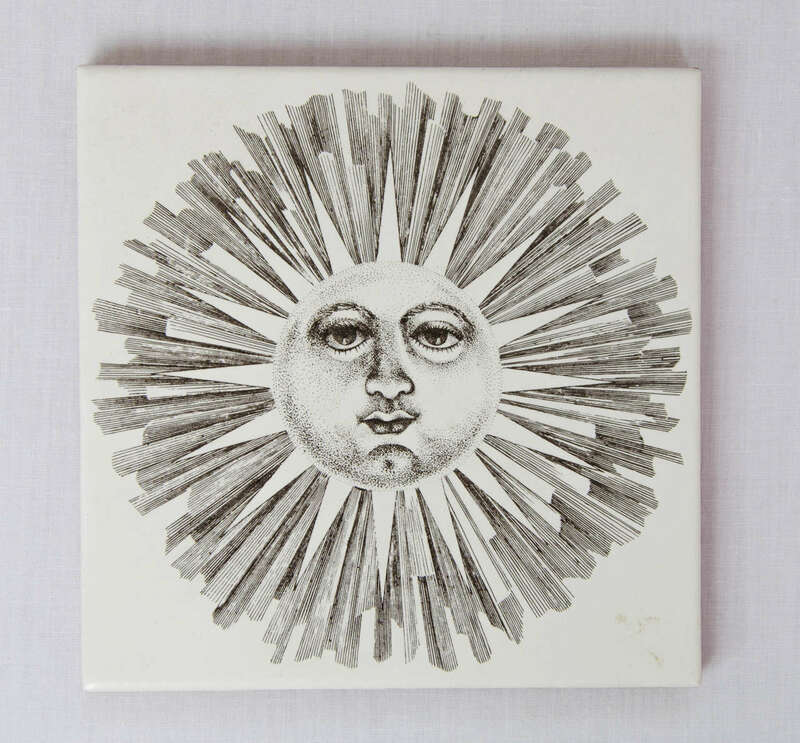 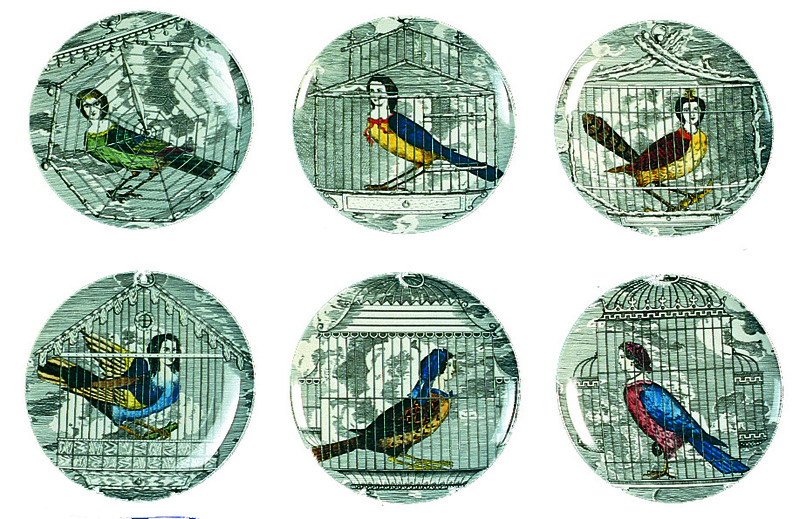 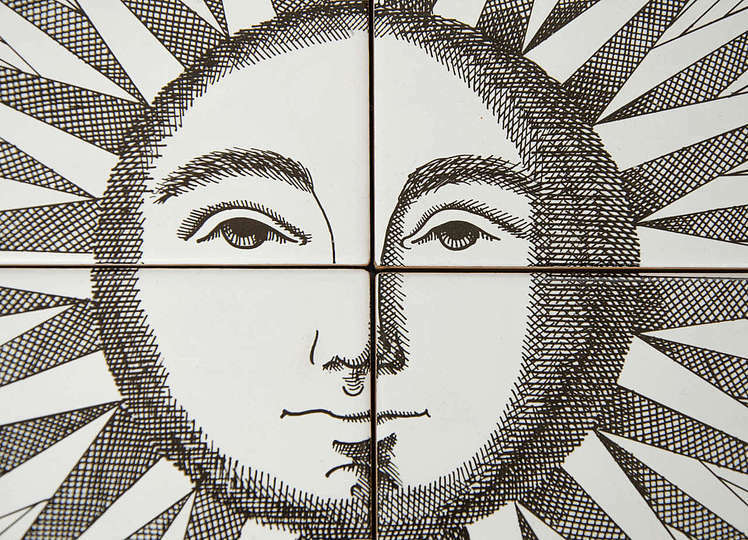 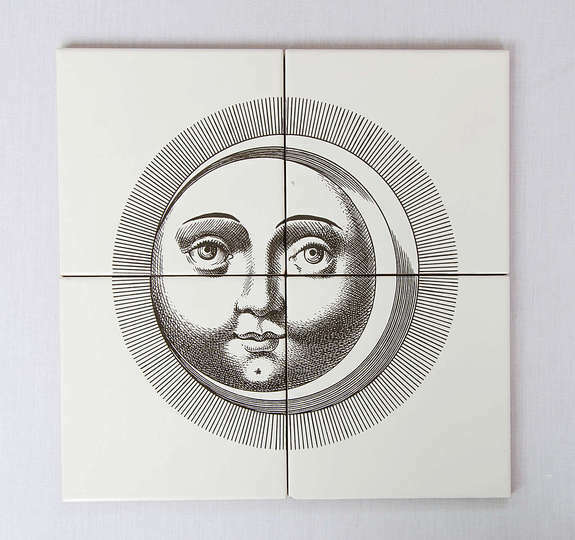 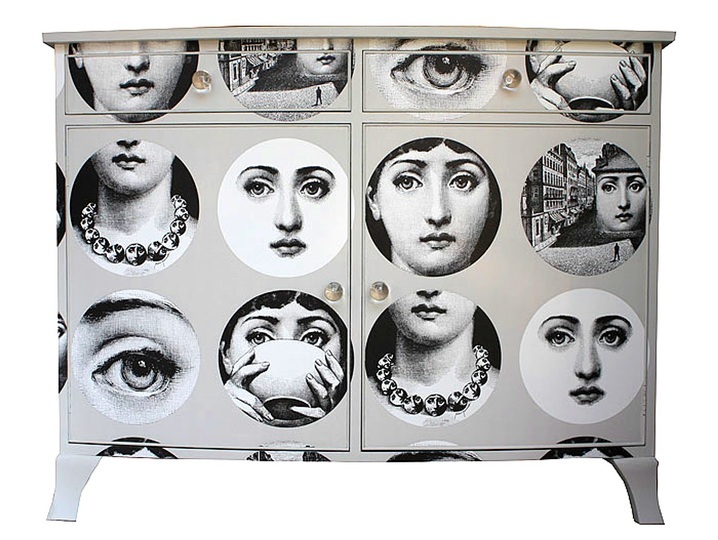 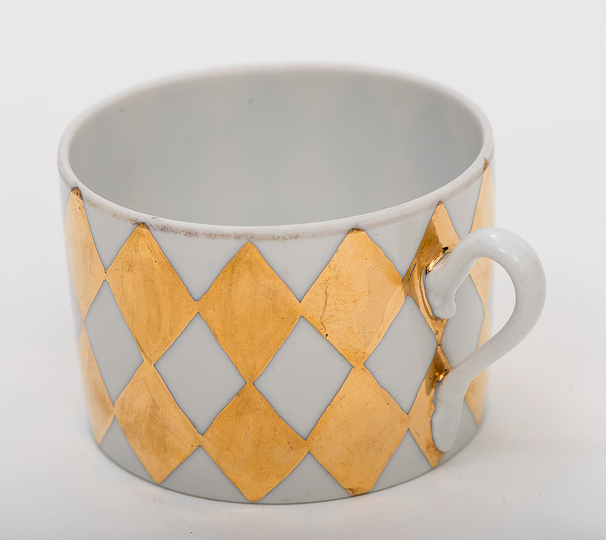 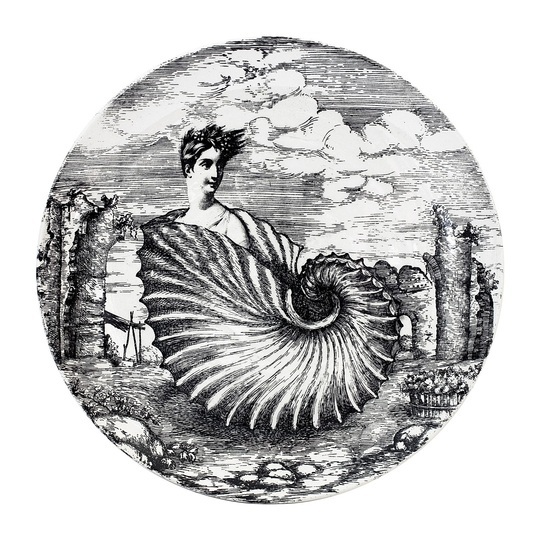 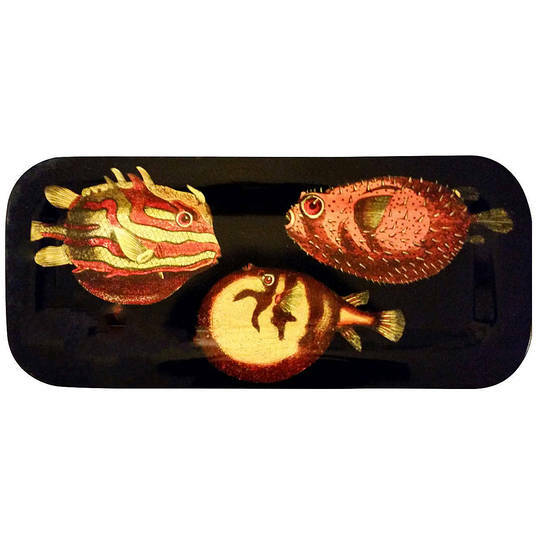 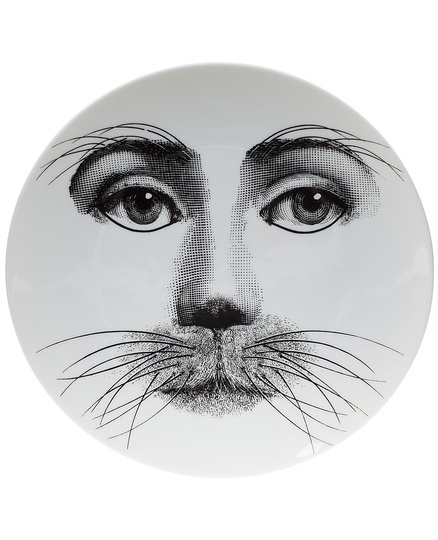 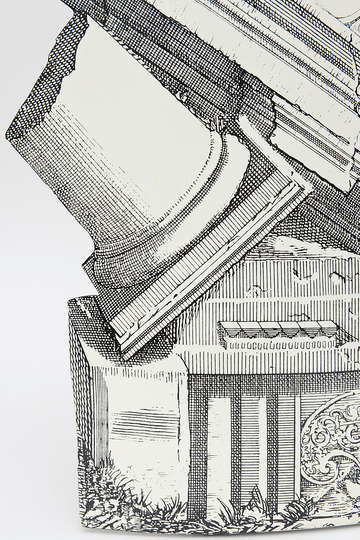 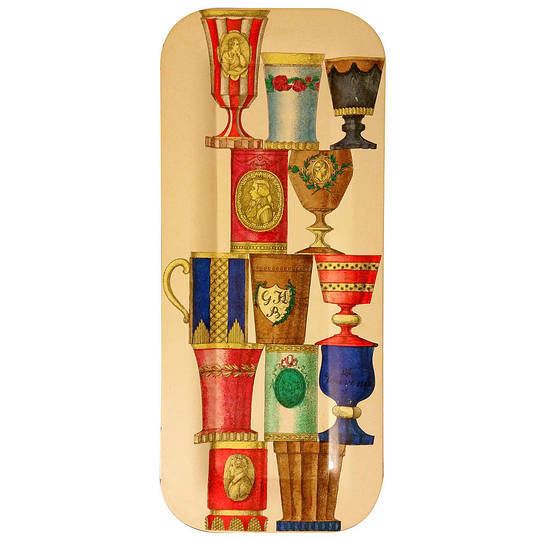 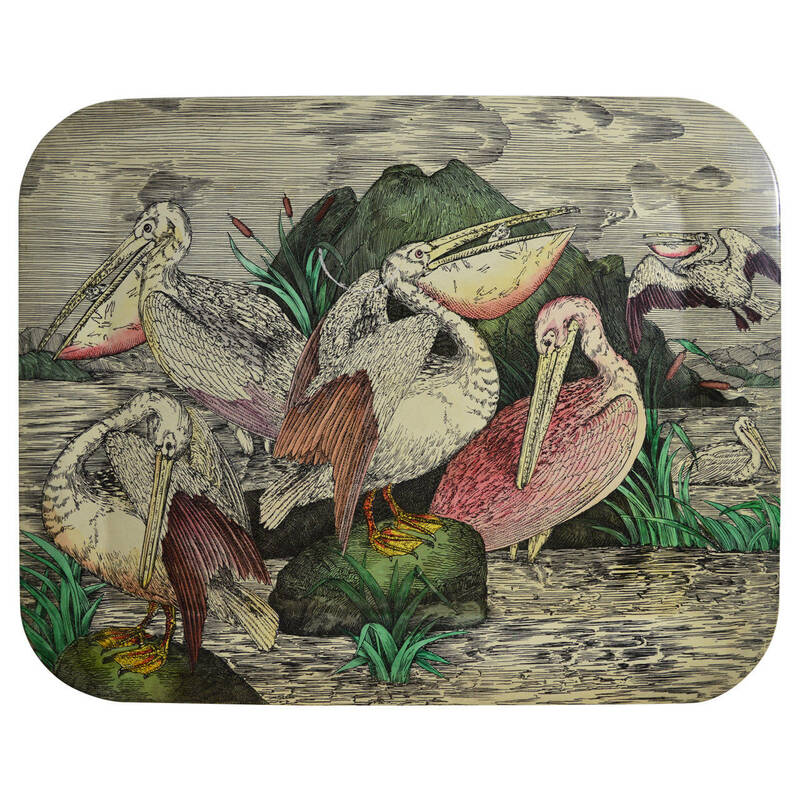 Piero Fornasetti (1913-1988) was one of the the pioneers of branded accessories. 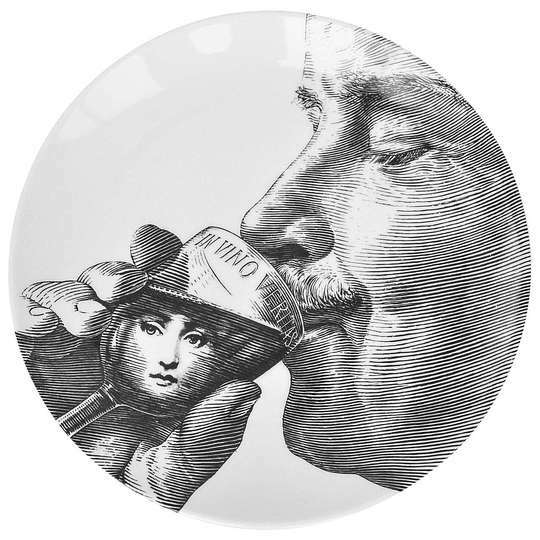 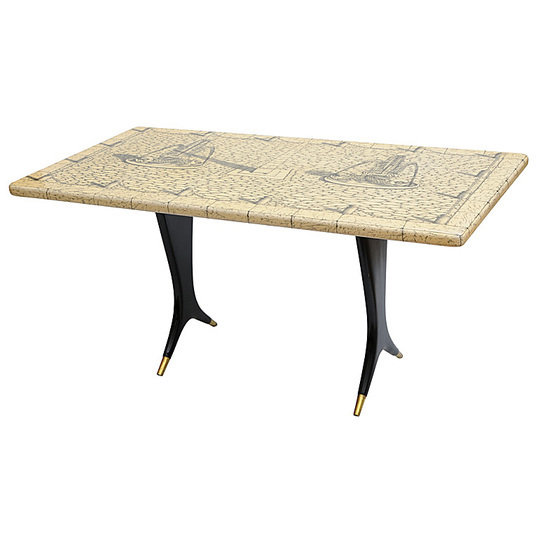 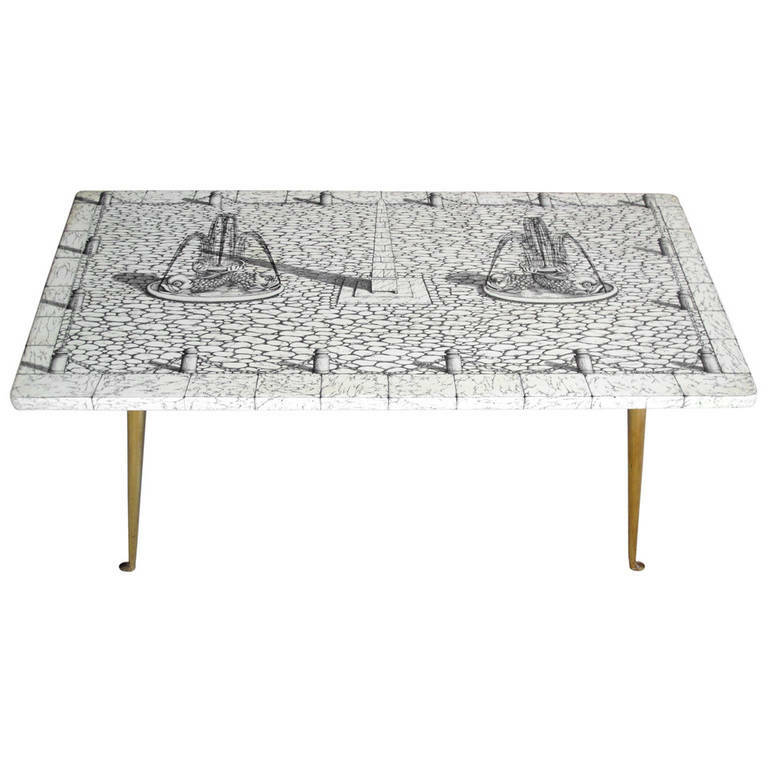 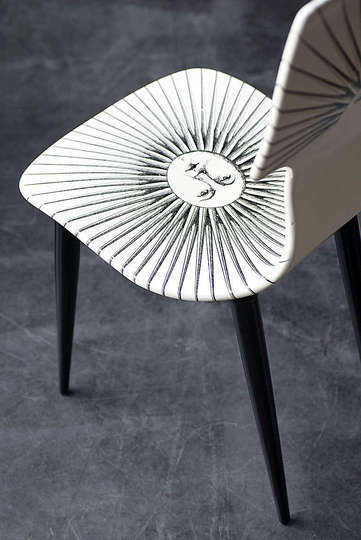 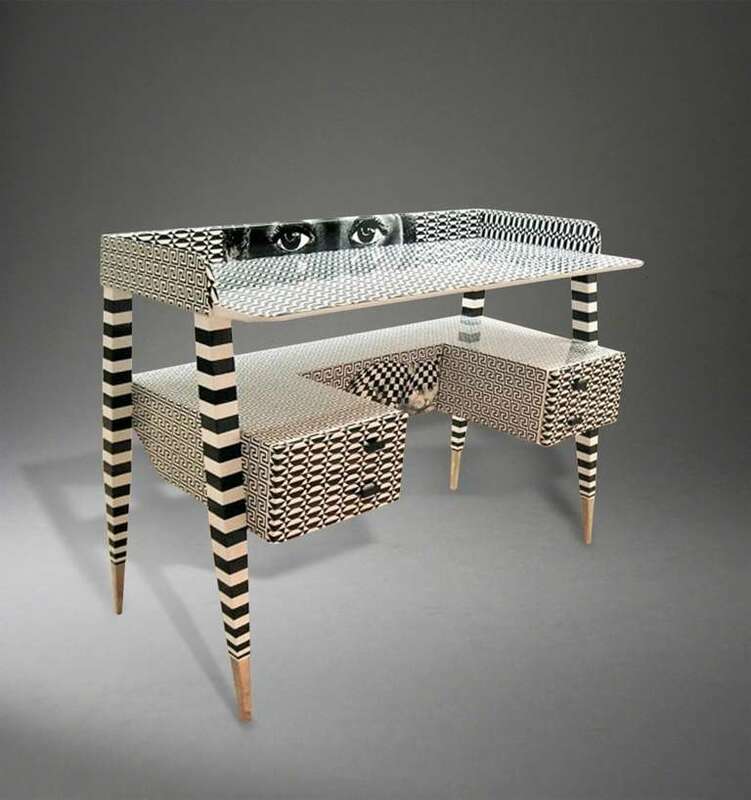 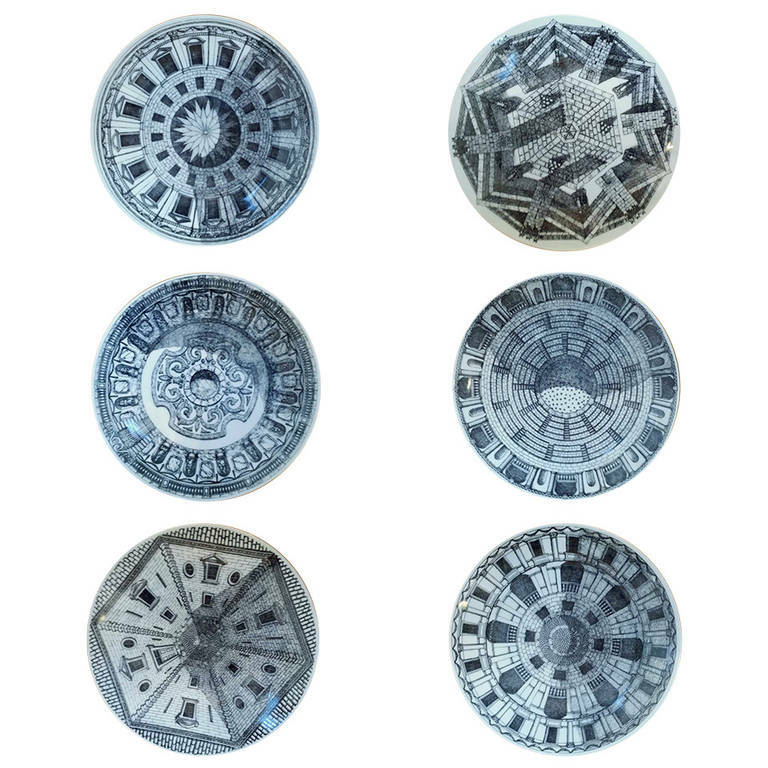 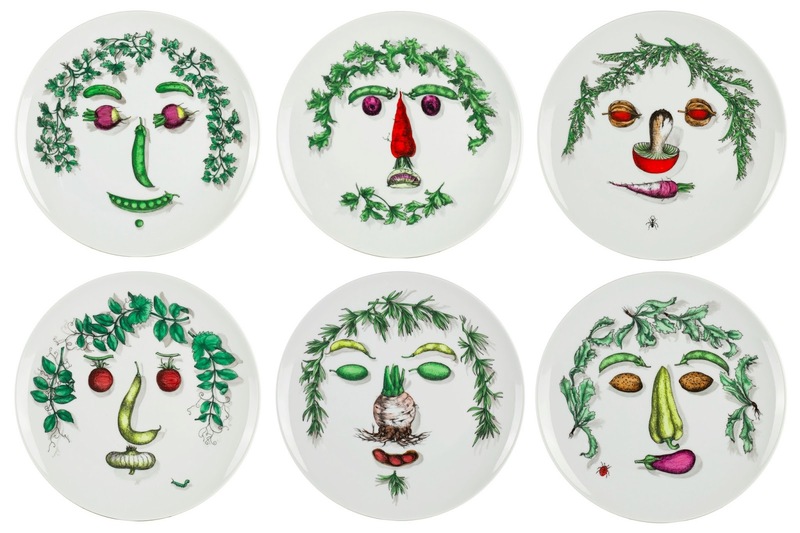 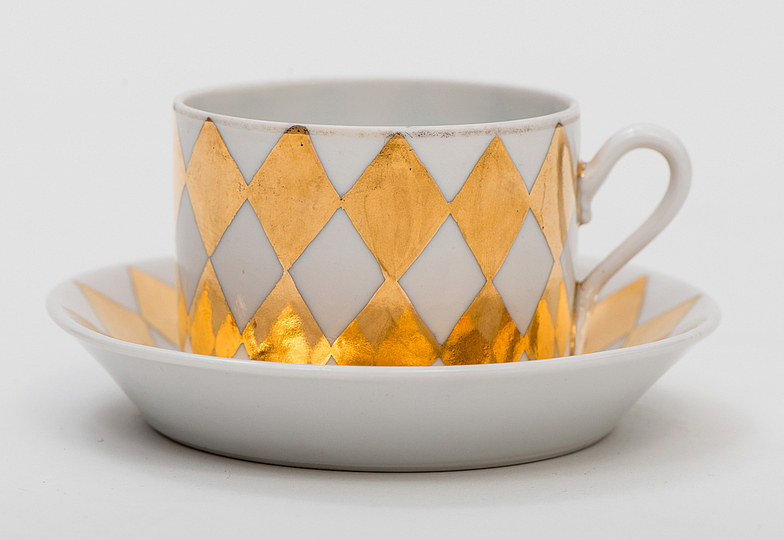 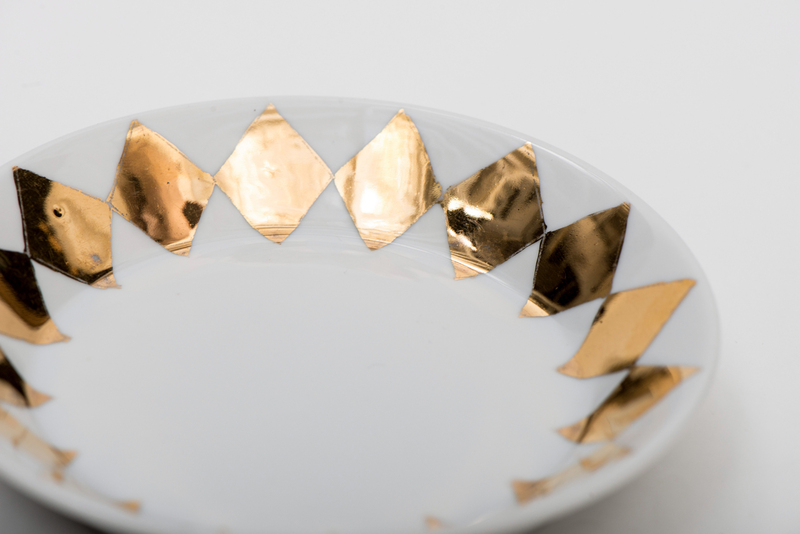 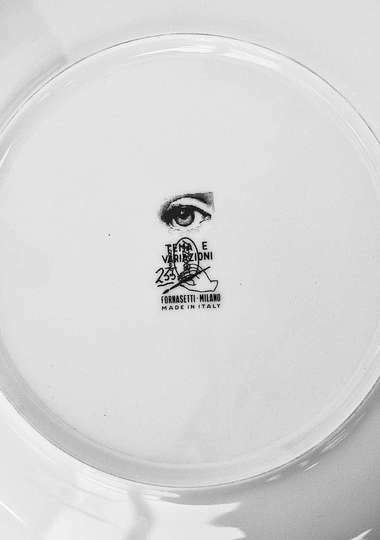 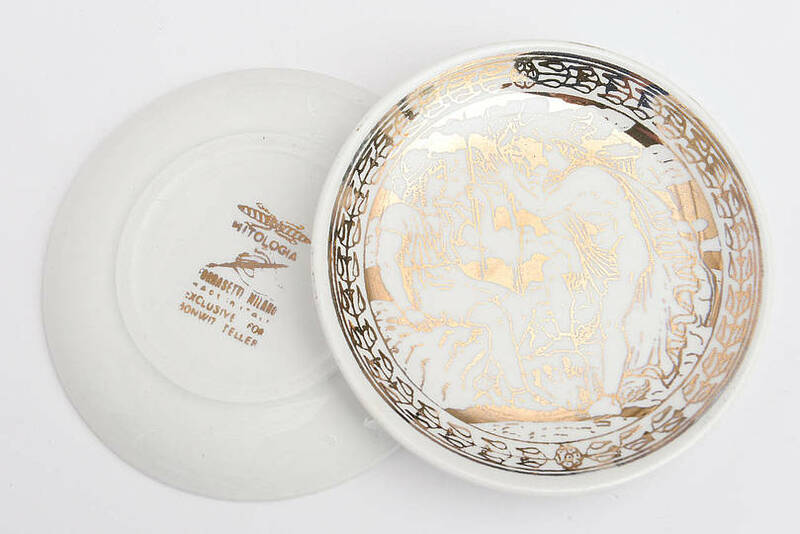 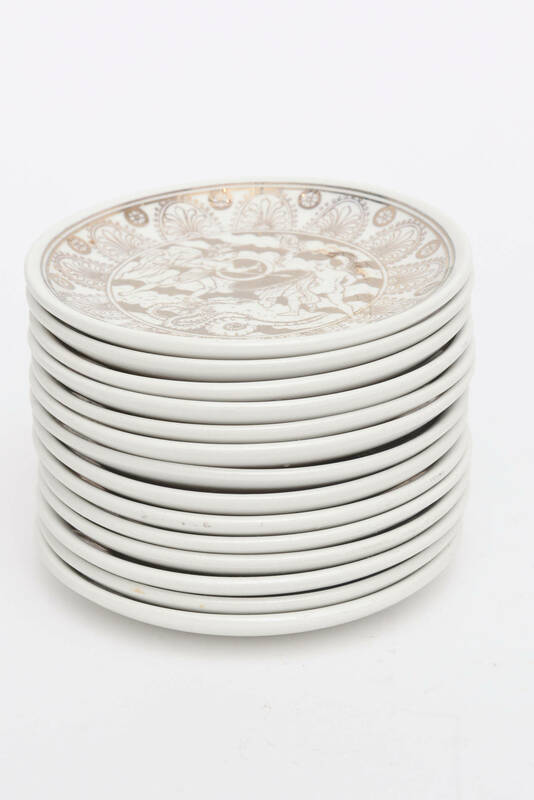 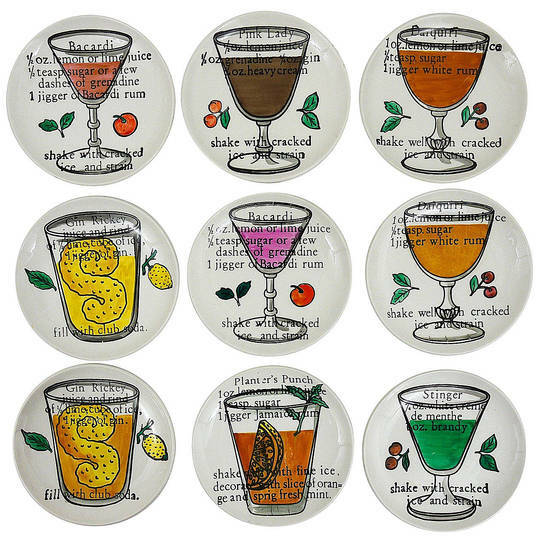 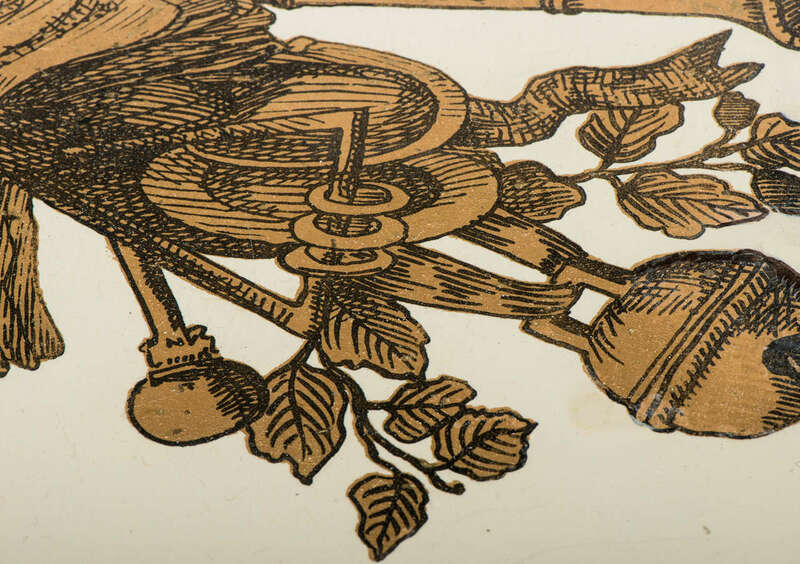 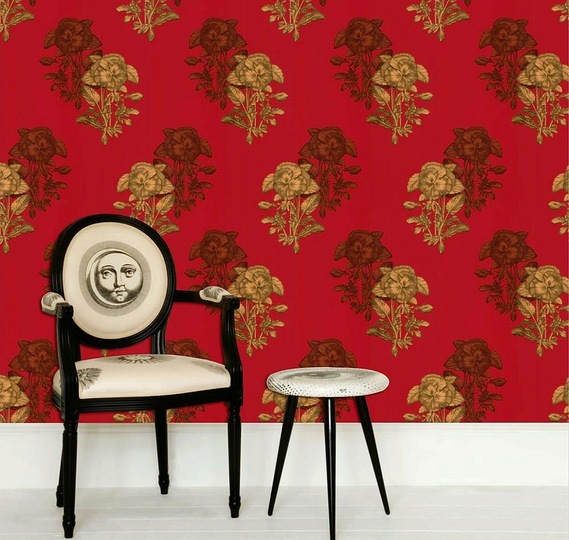 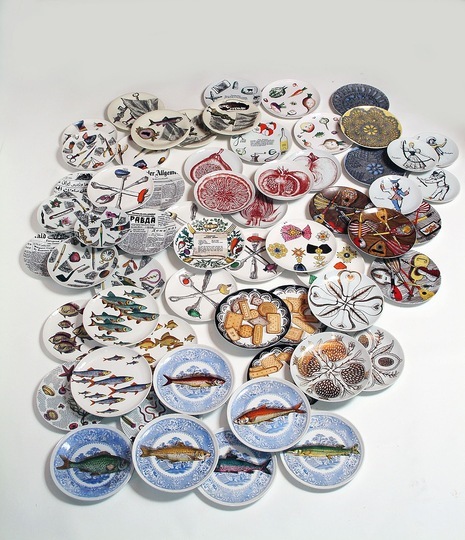 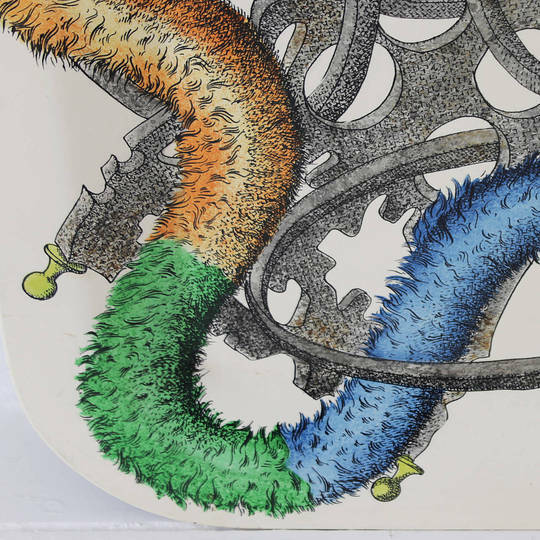 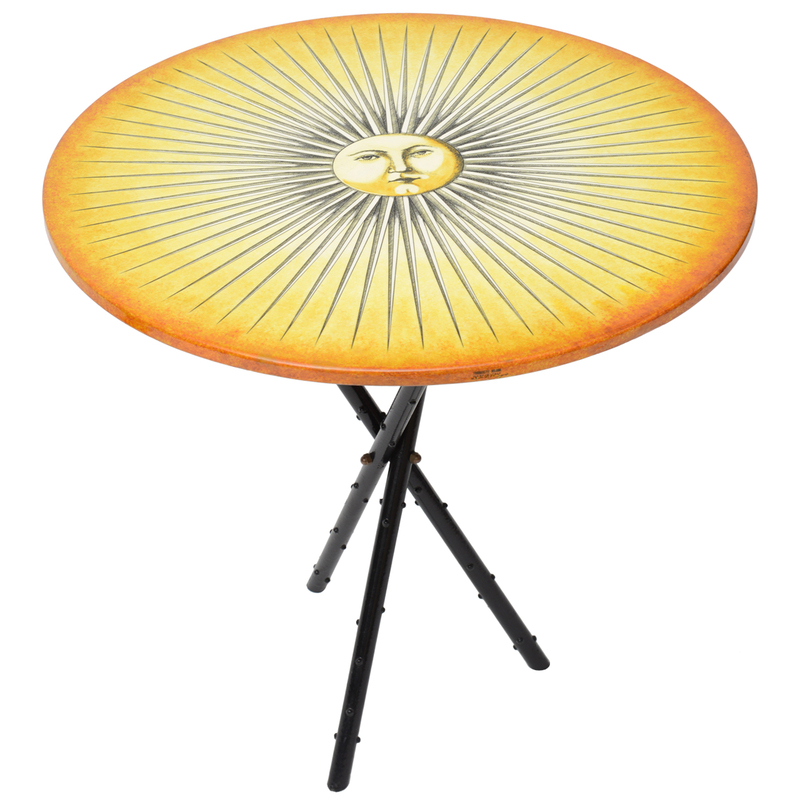 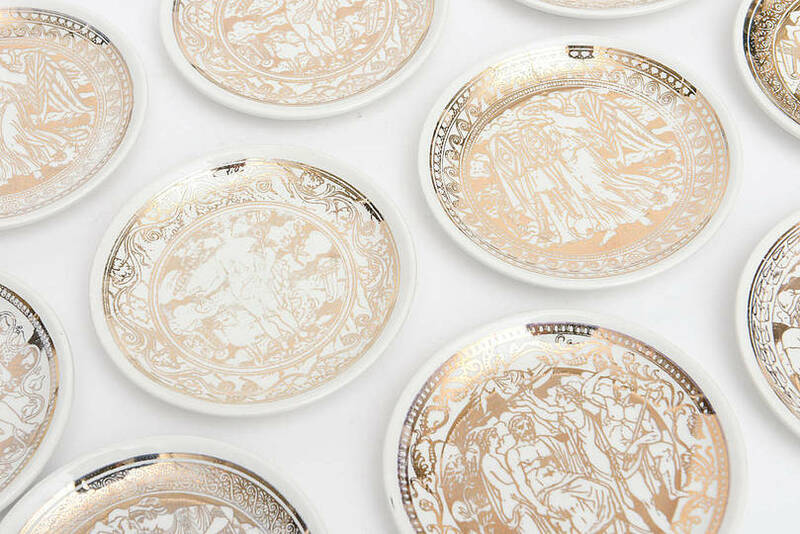 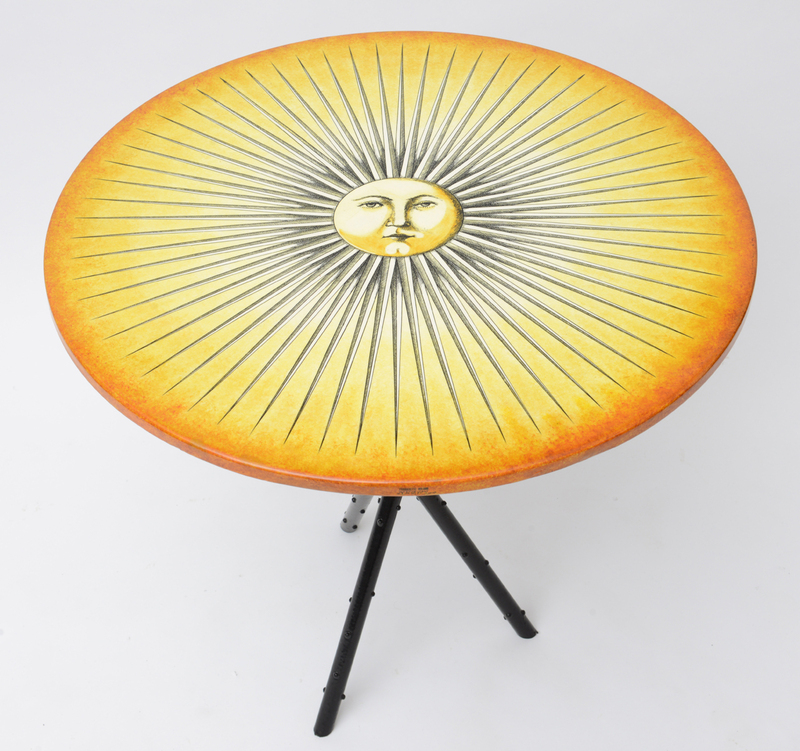 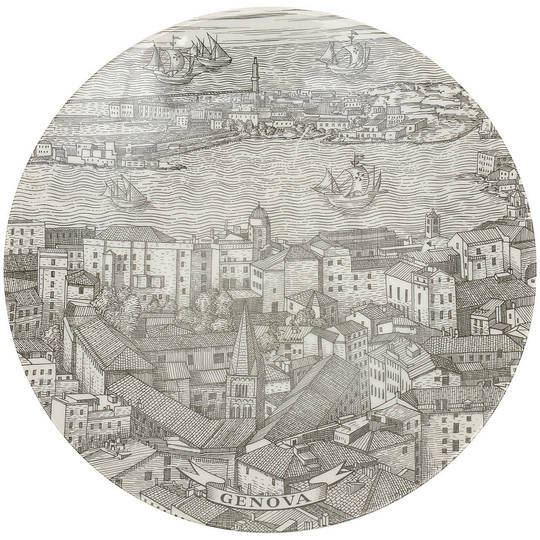 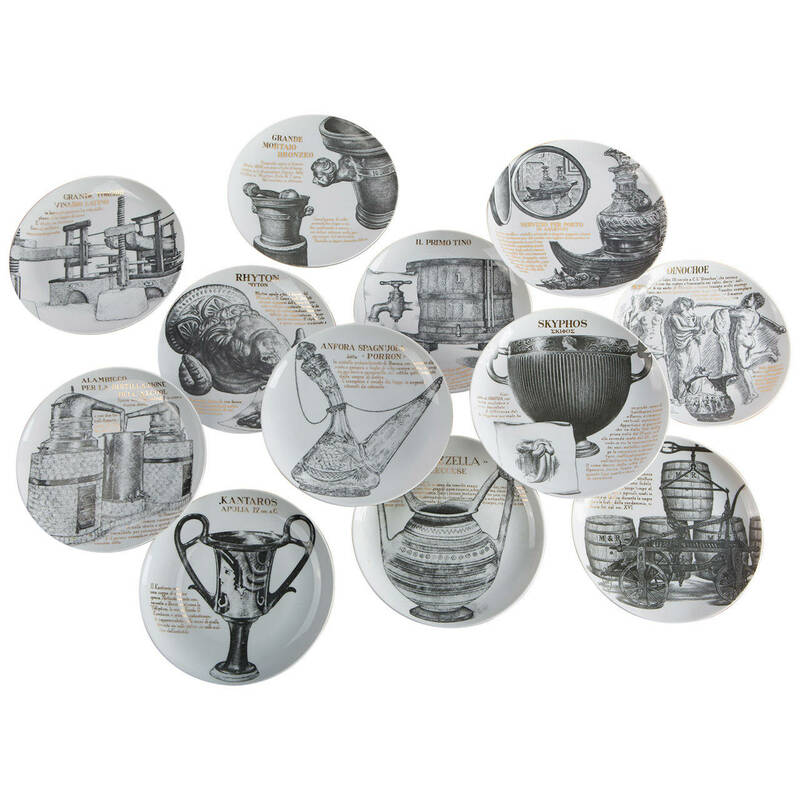 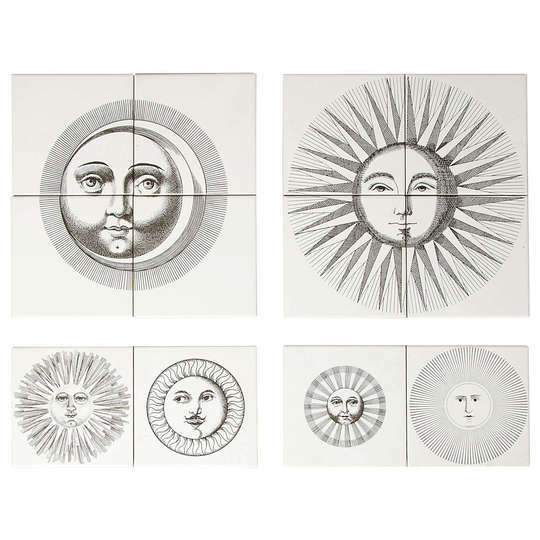 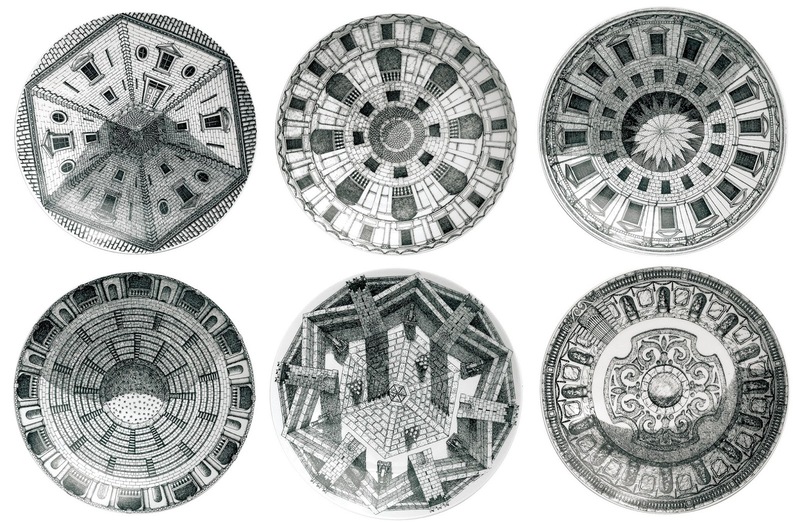 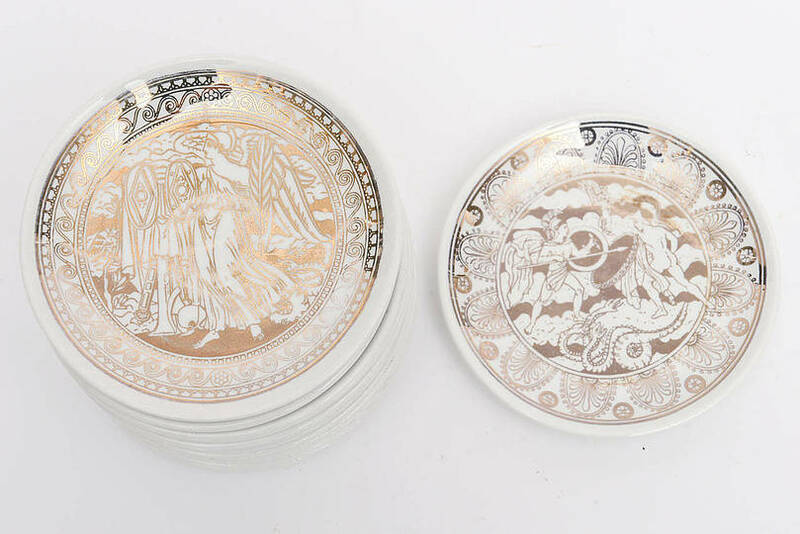 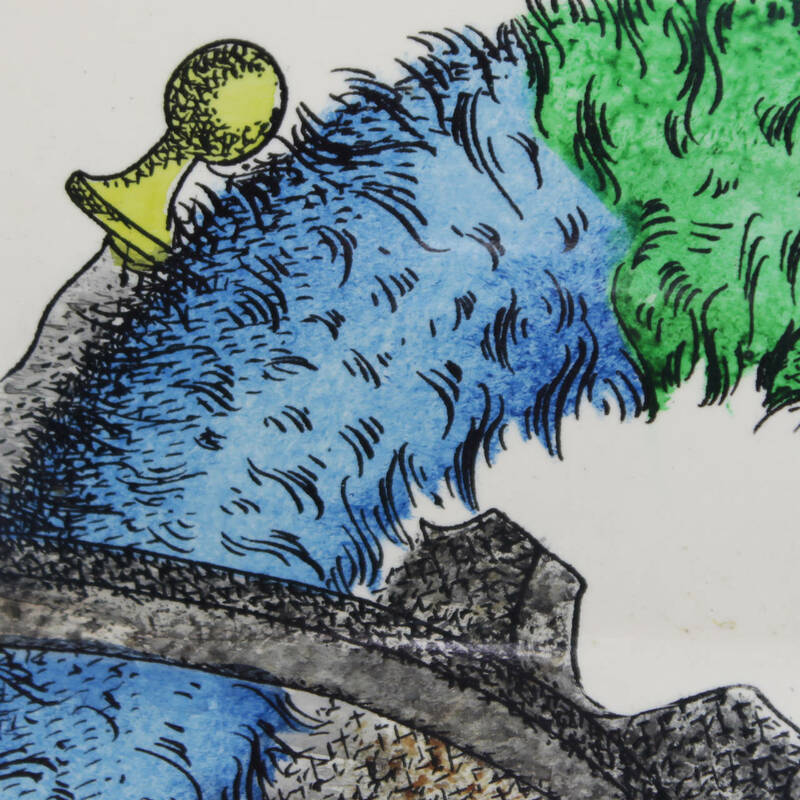 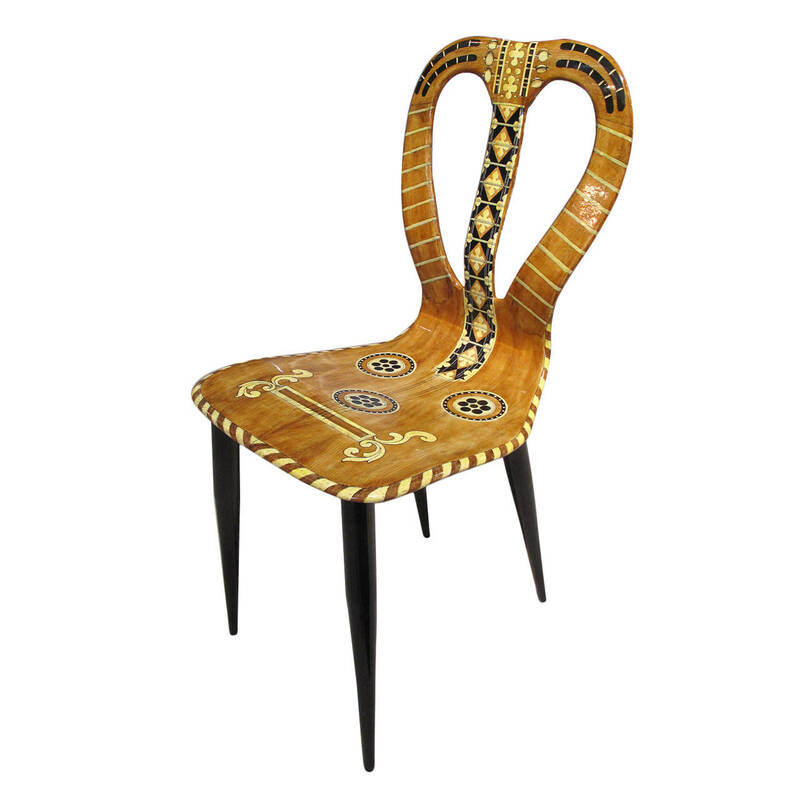 He designed more than 11,000 products with the Fornasetti label including tableware, accessories, furniture, rugs and tiles. 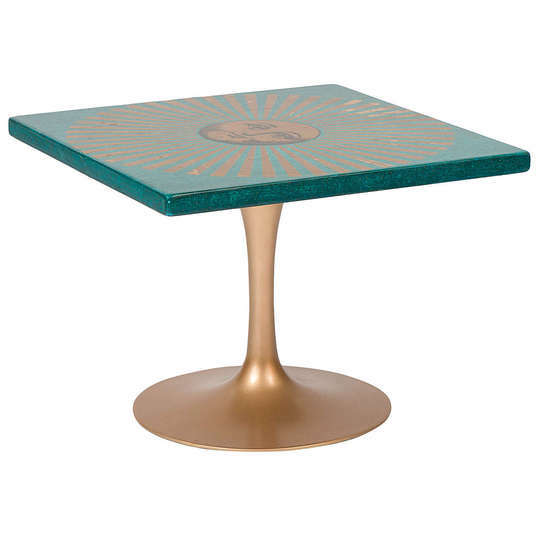 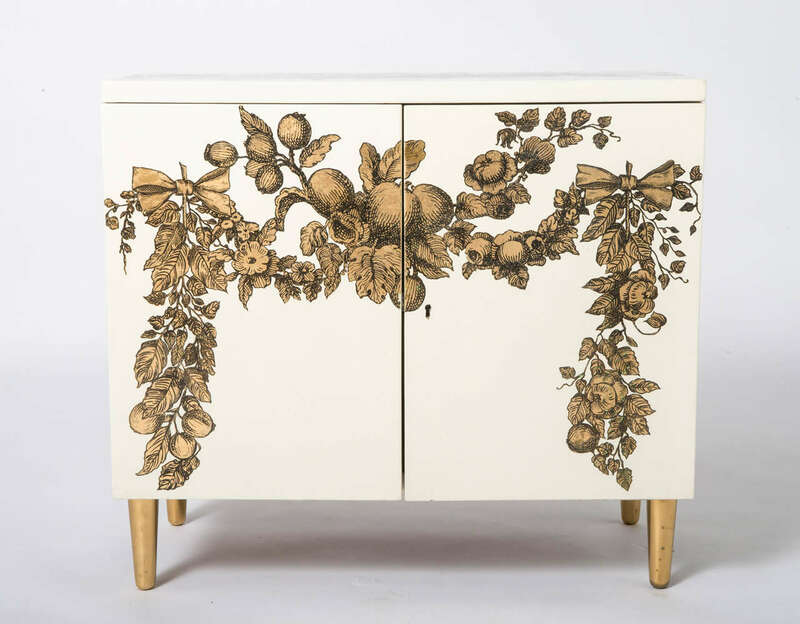 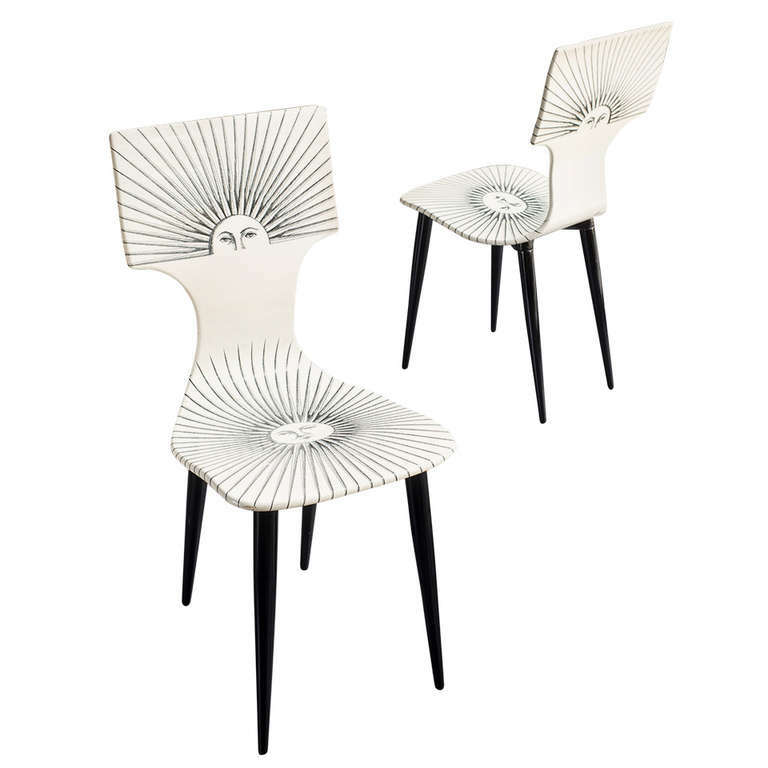 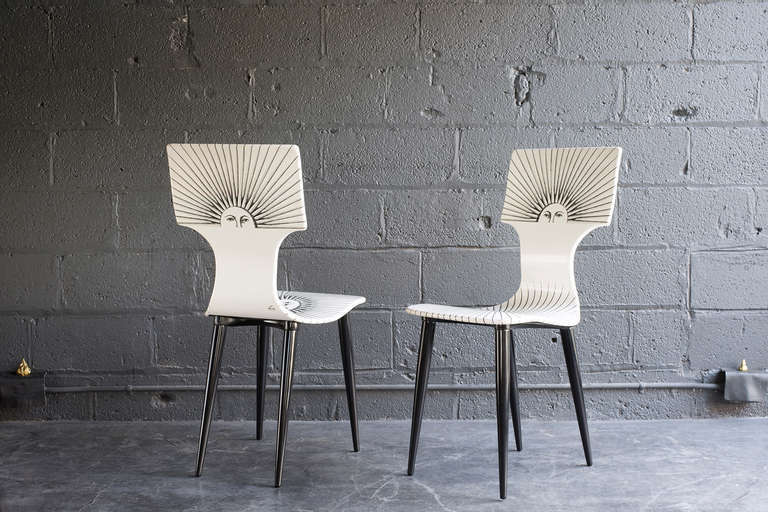 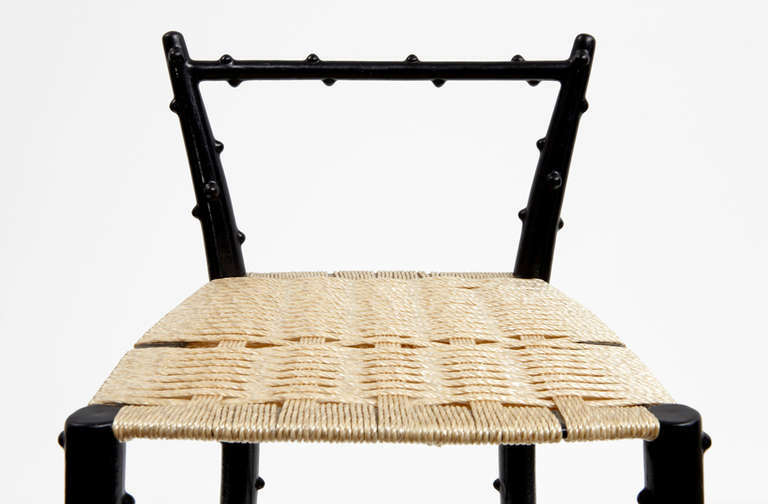 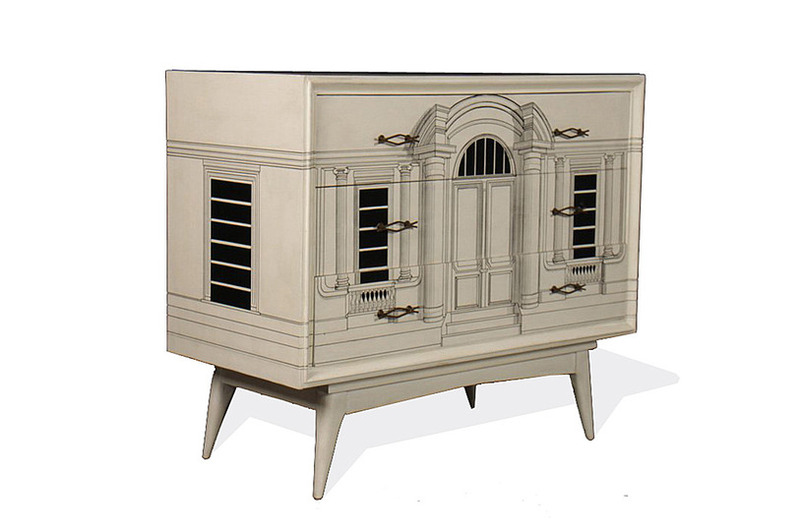 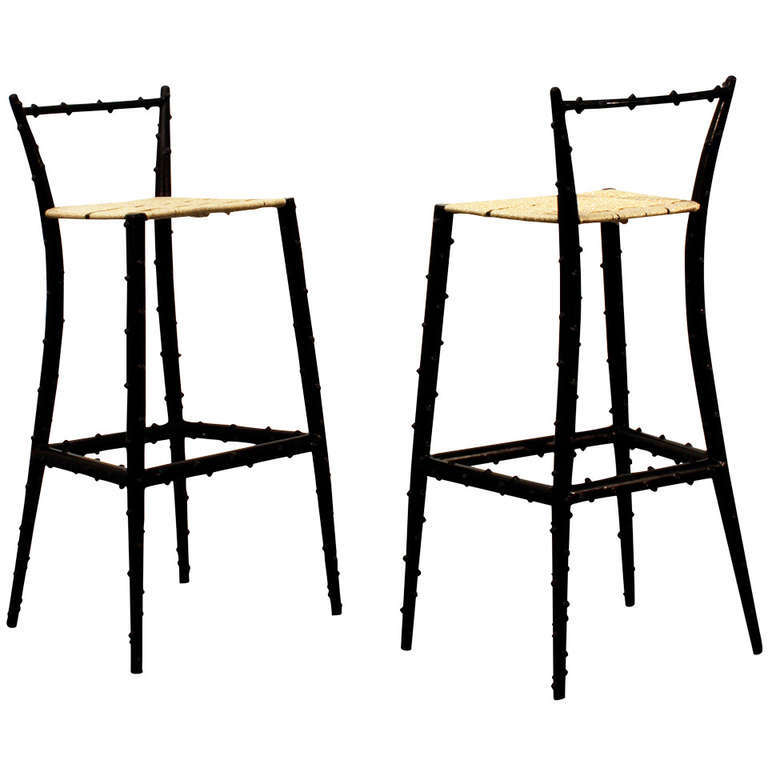 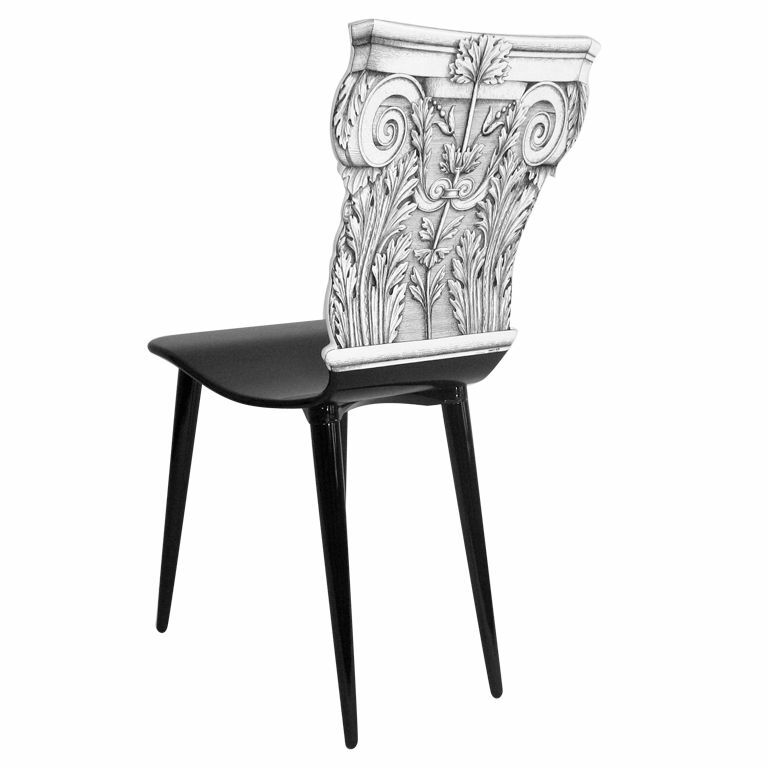 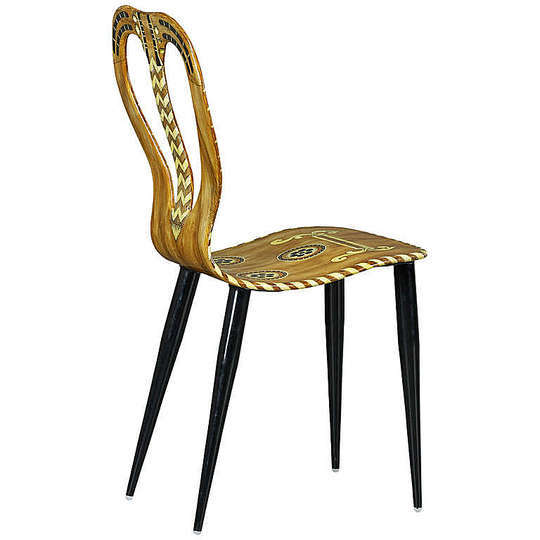 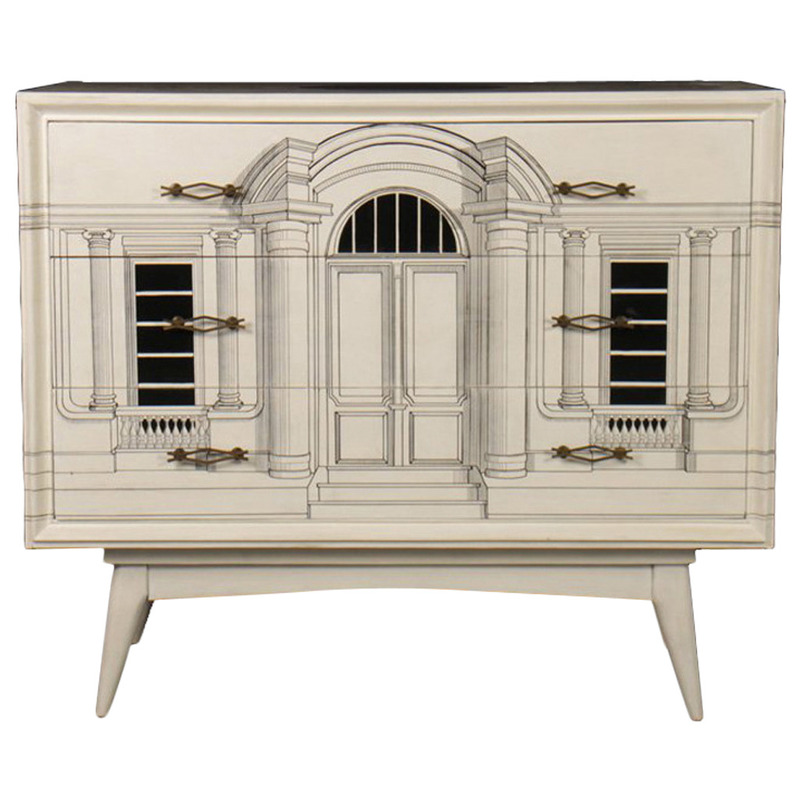 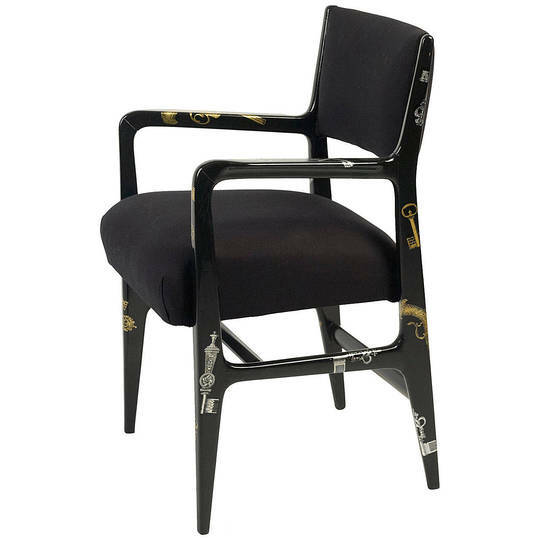 In collaboration with legendary Italian architect Gio Ponti, he also produced chairs, sideboards and tables. 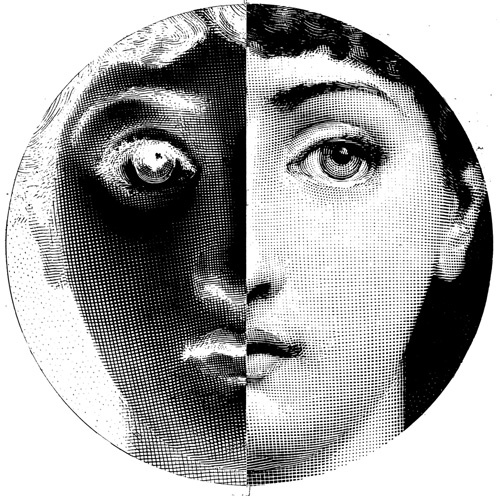 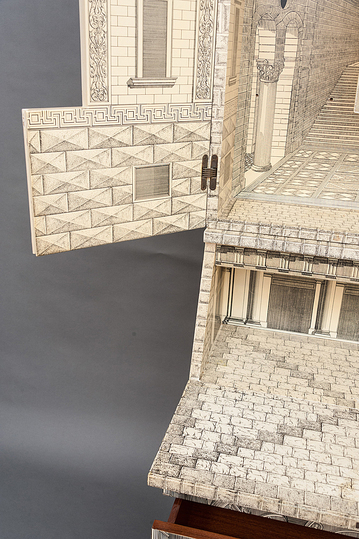 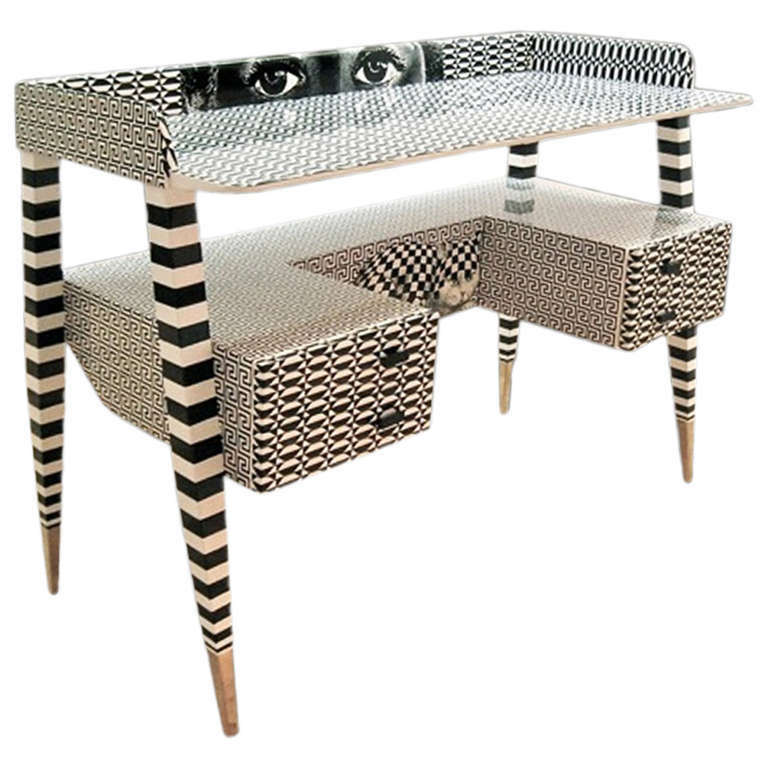 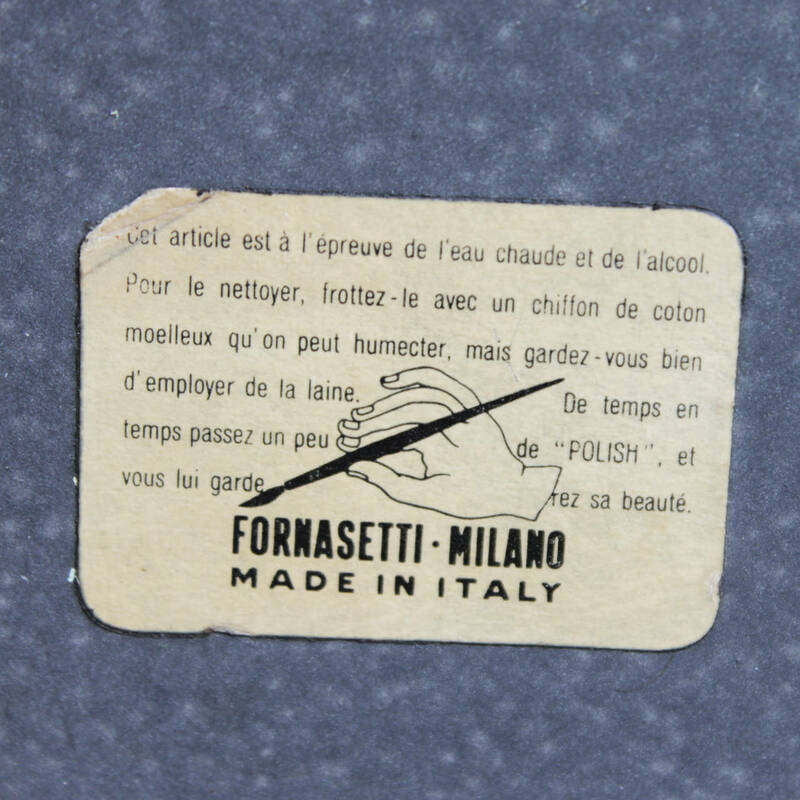 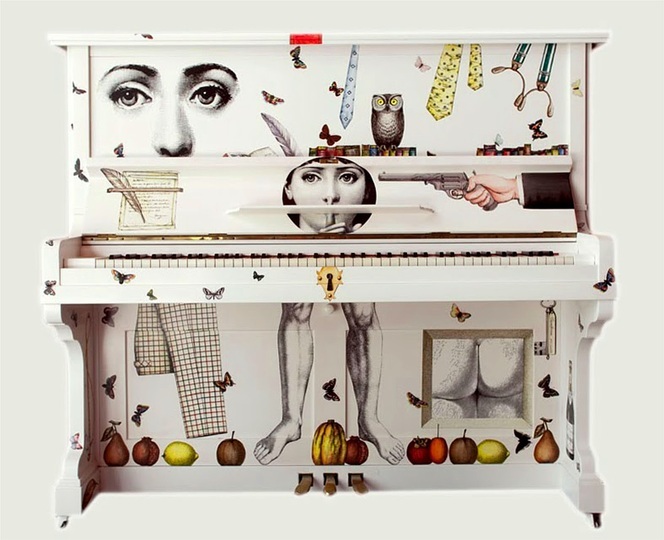 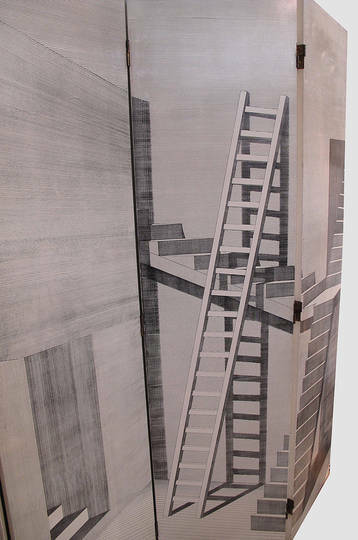 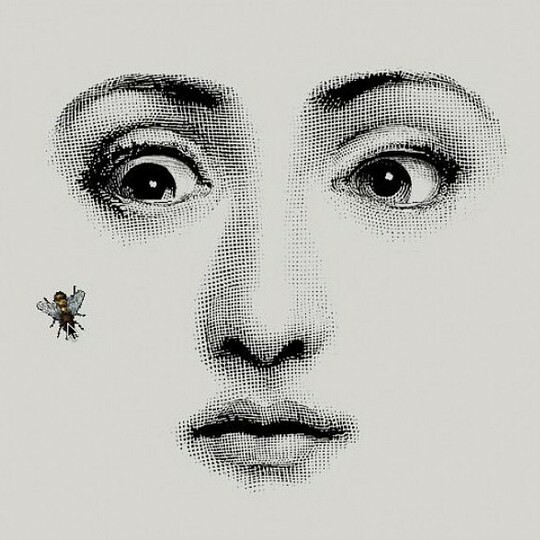 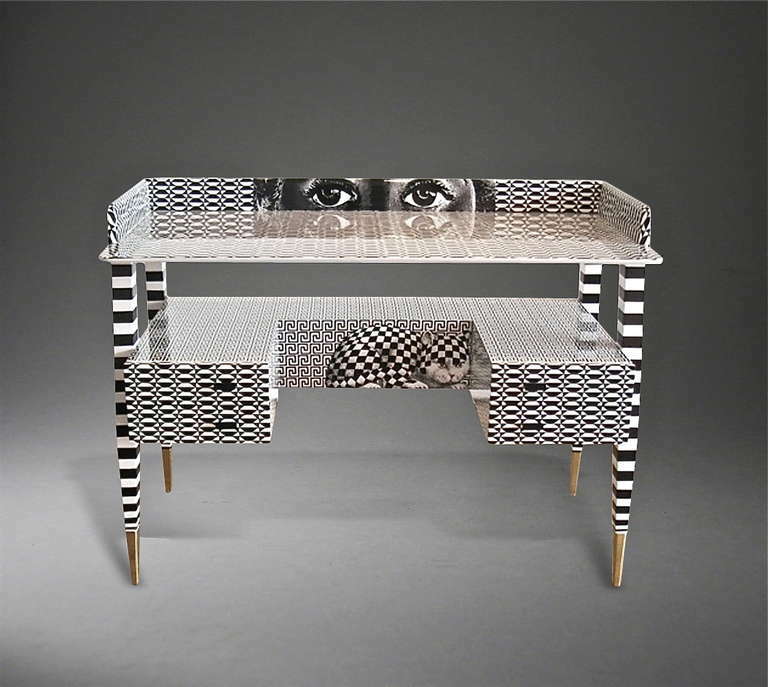 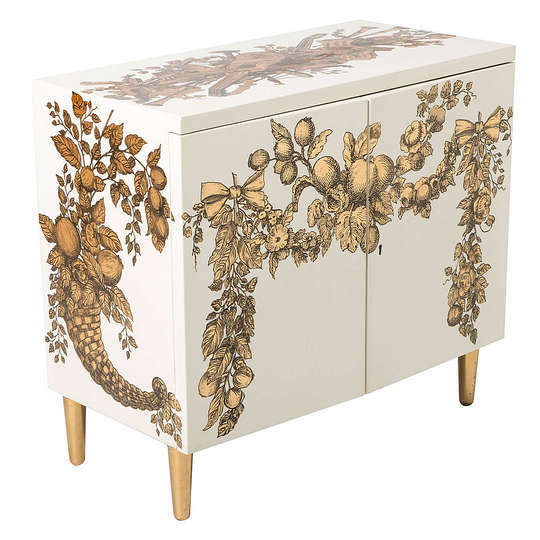 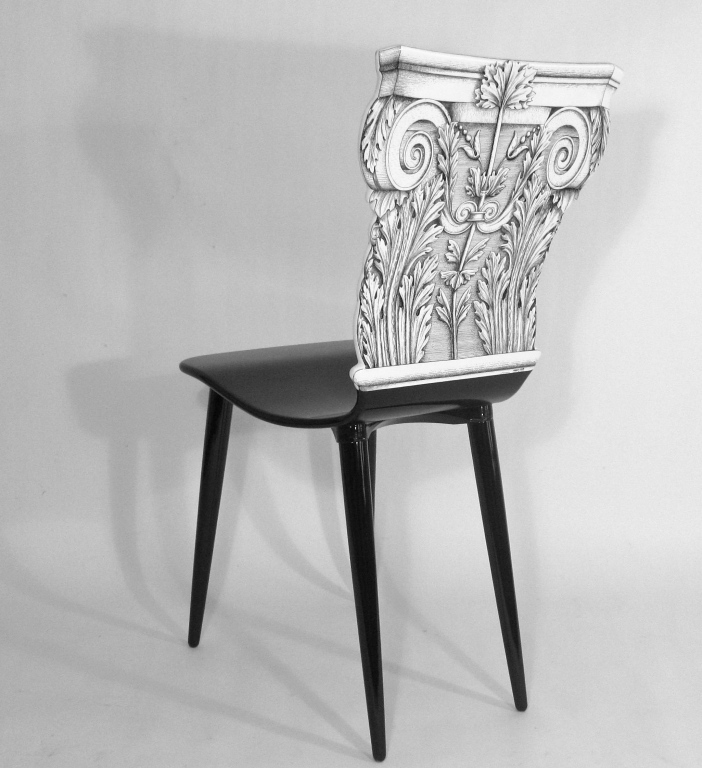 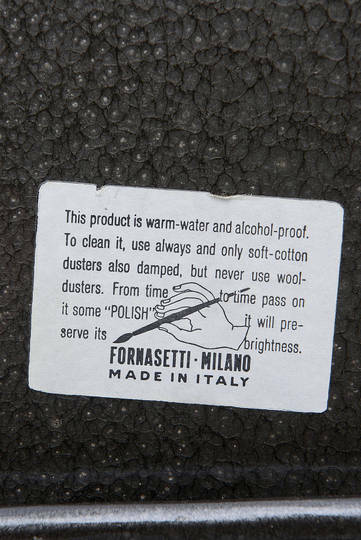 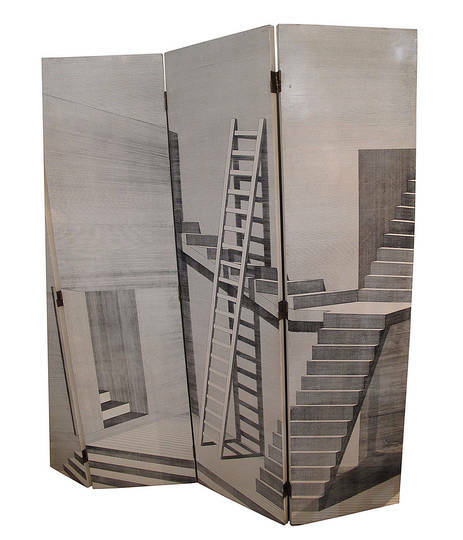 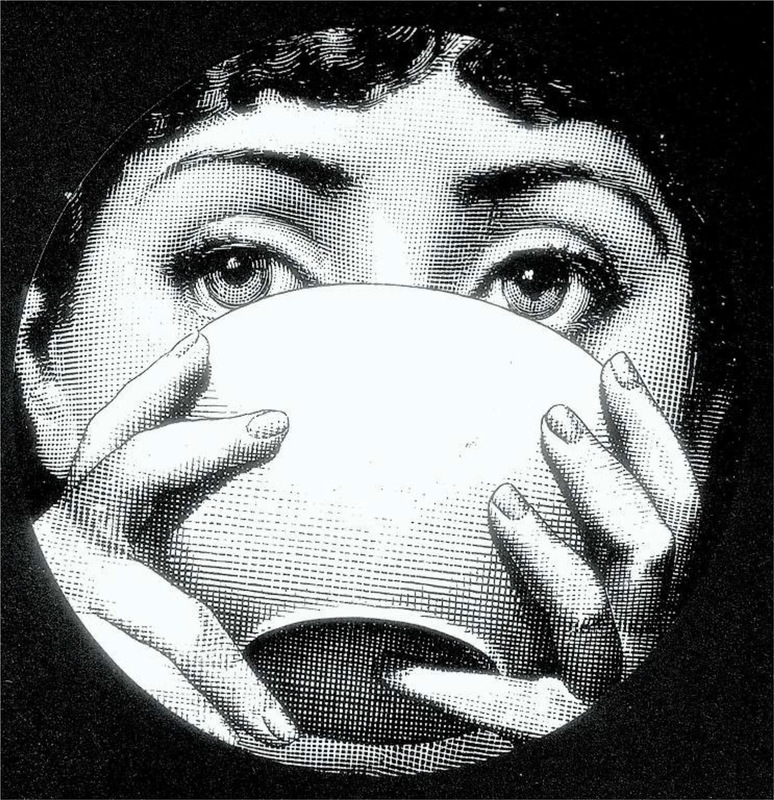 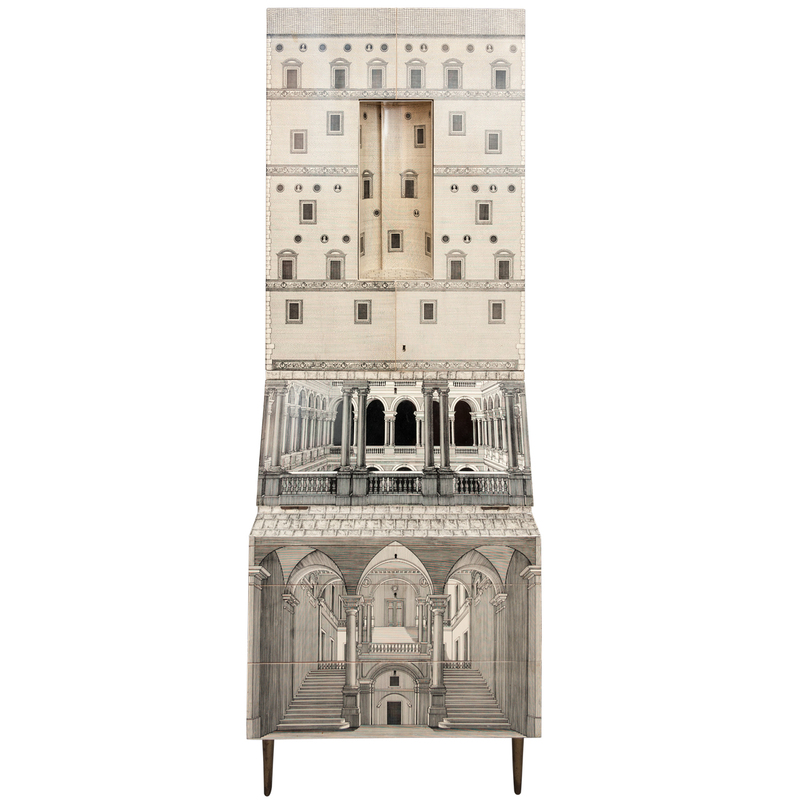 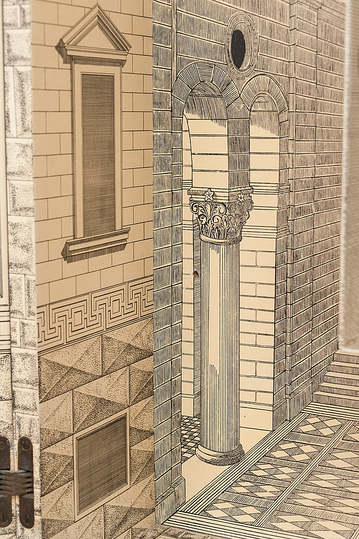 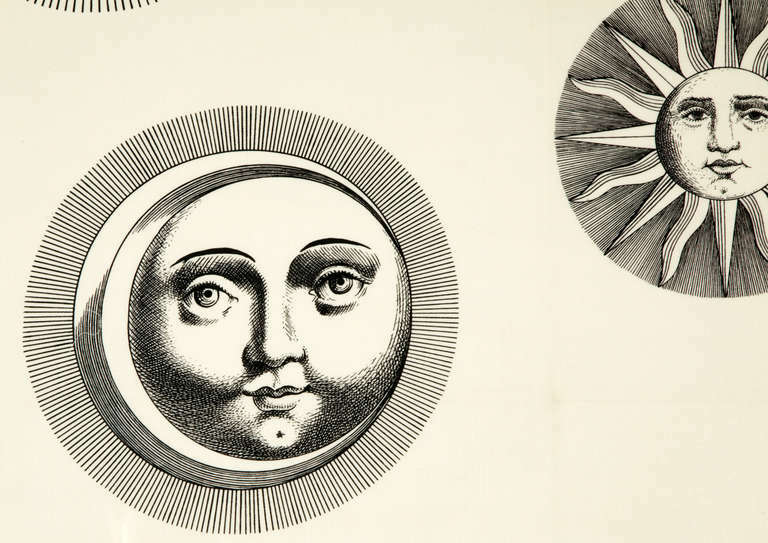 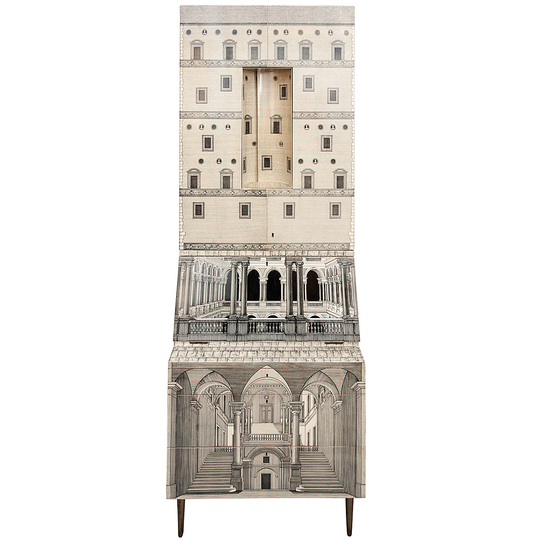 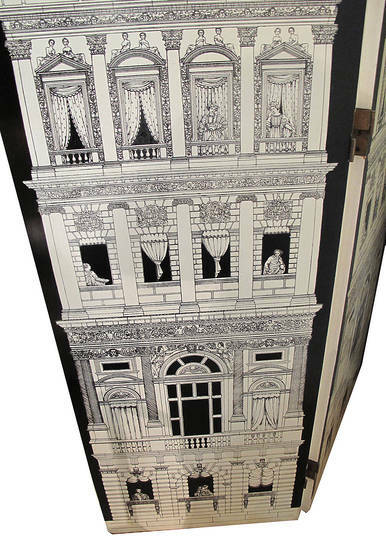 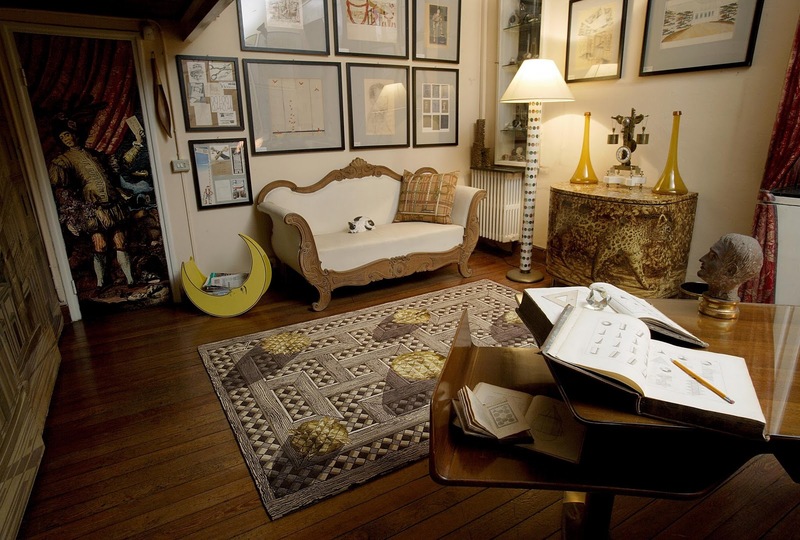 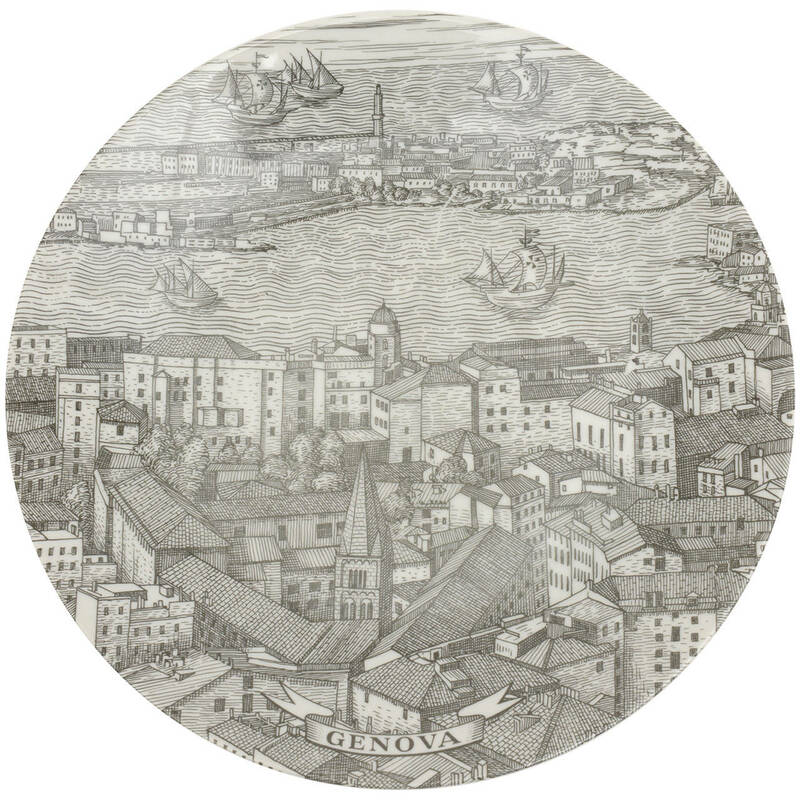 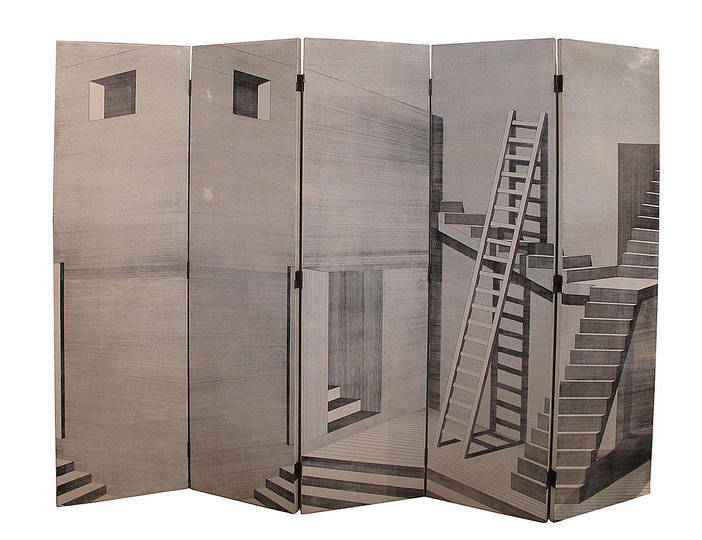 Fornasetti lived and worked in Milan. 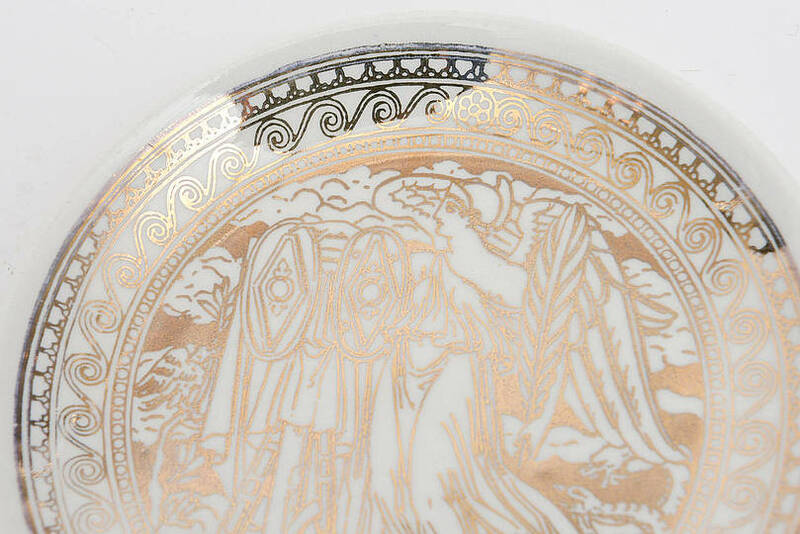 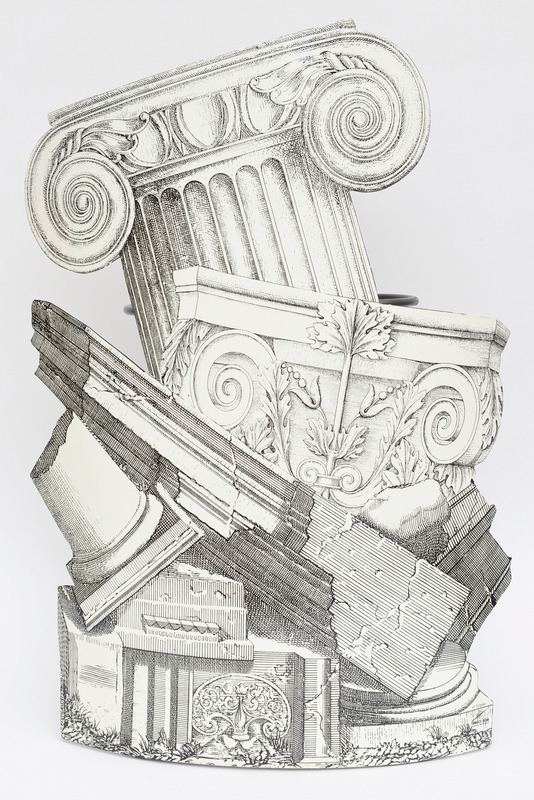 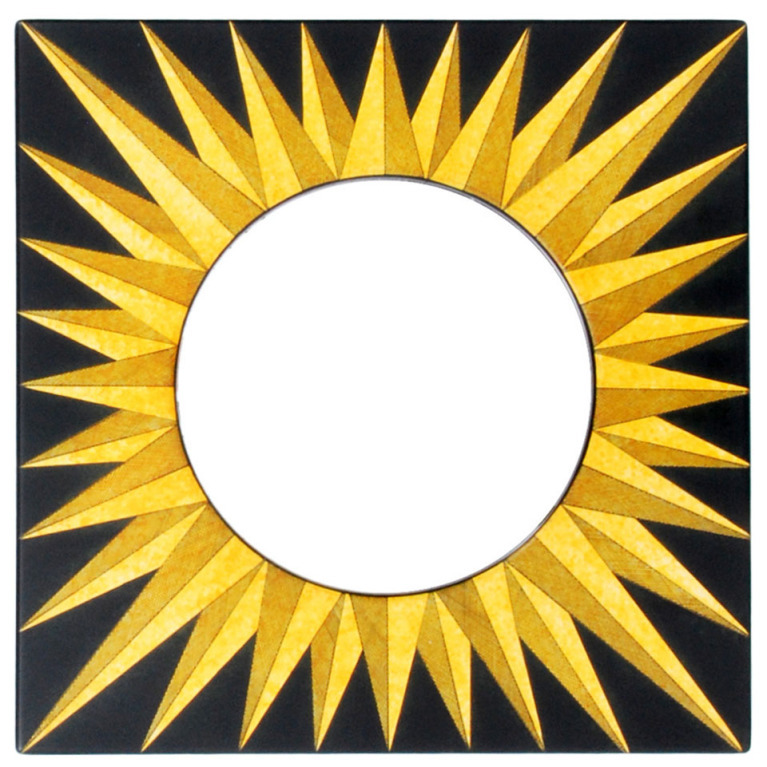 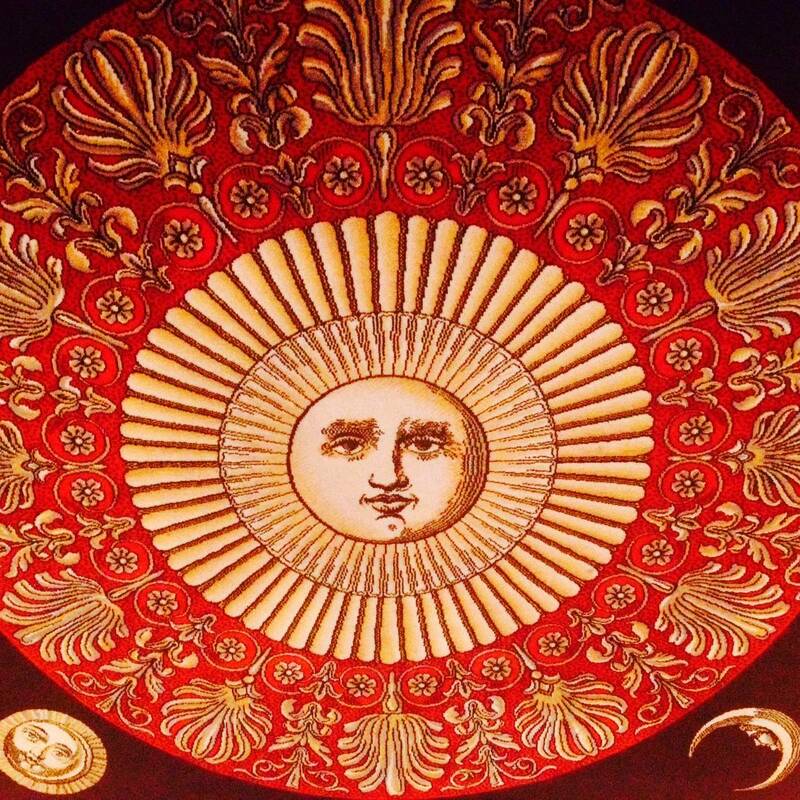 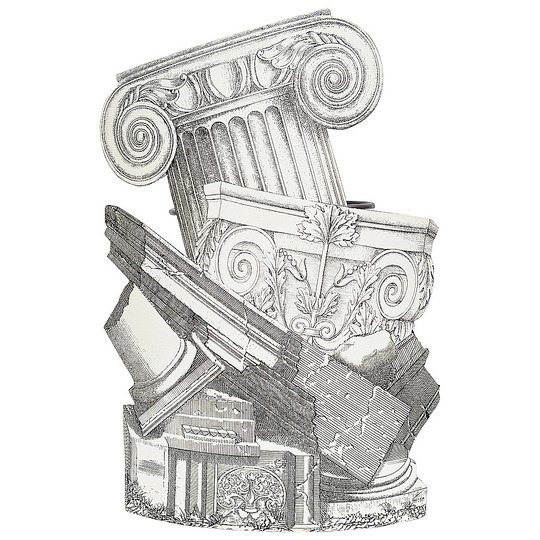 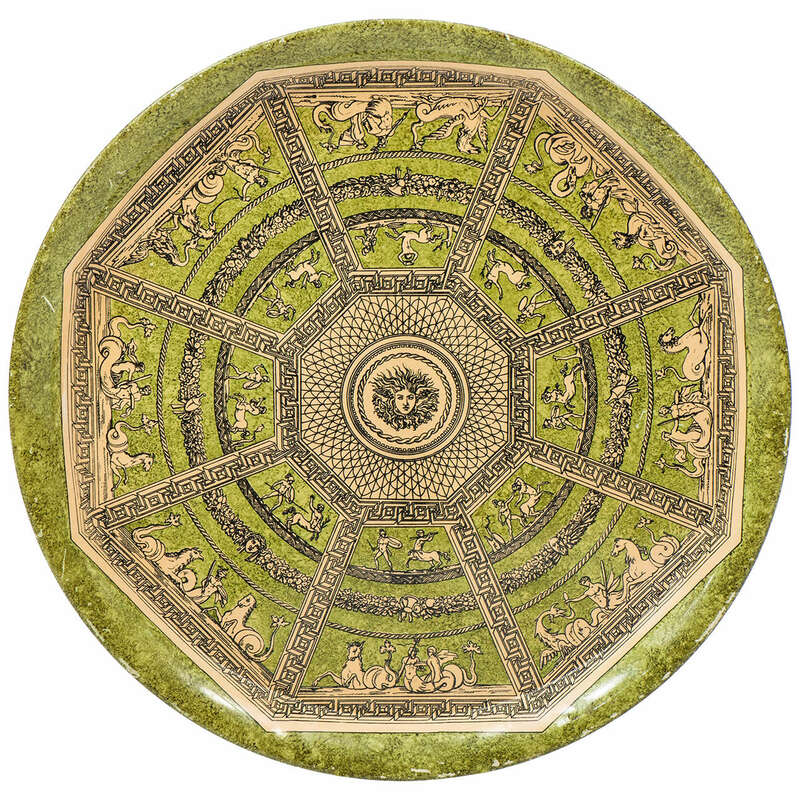 There are recurring topics in his typical visual vocabulary, where he mixes classical motifs with a good measure of irony: Suns, moons, elements of classical Greek and Roman architecture, and a female face. 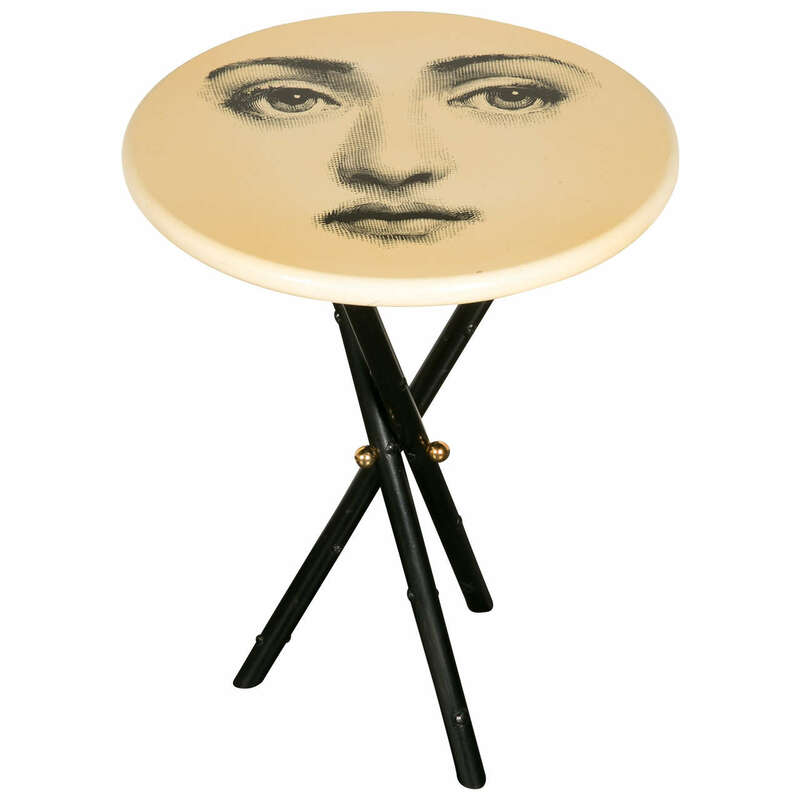 The face is the portrait of Natalina (Lina) Cavalieri (1875-1944), a diva of the Belle Epoque with an extraordinary life story. 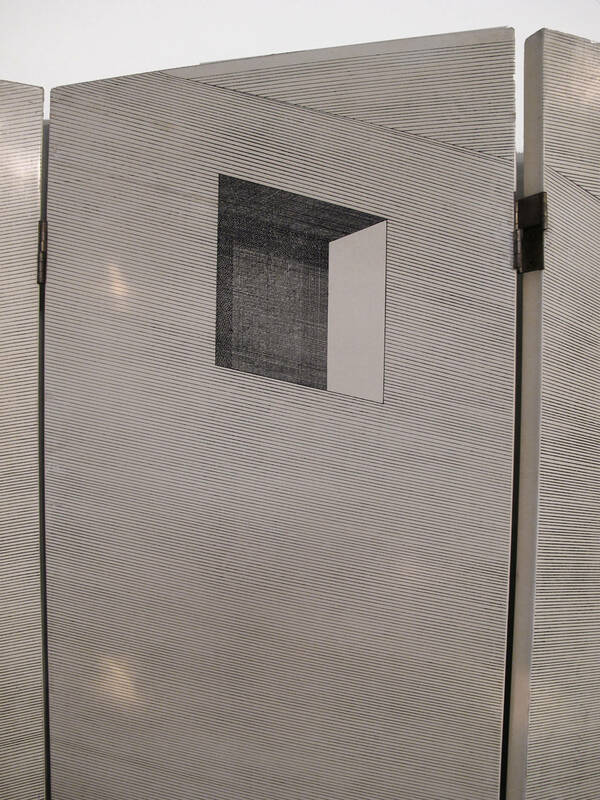 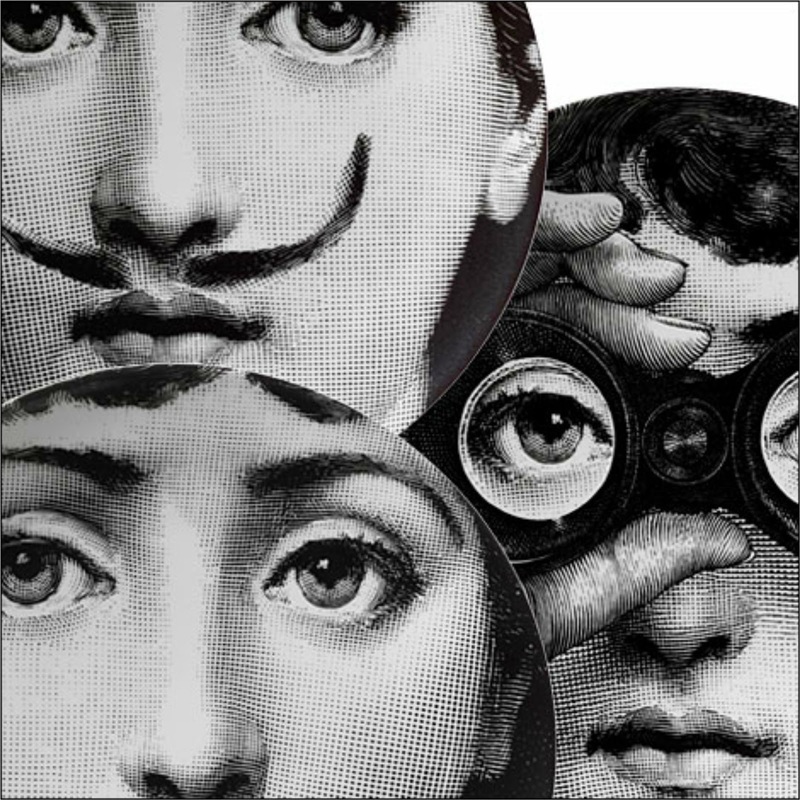 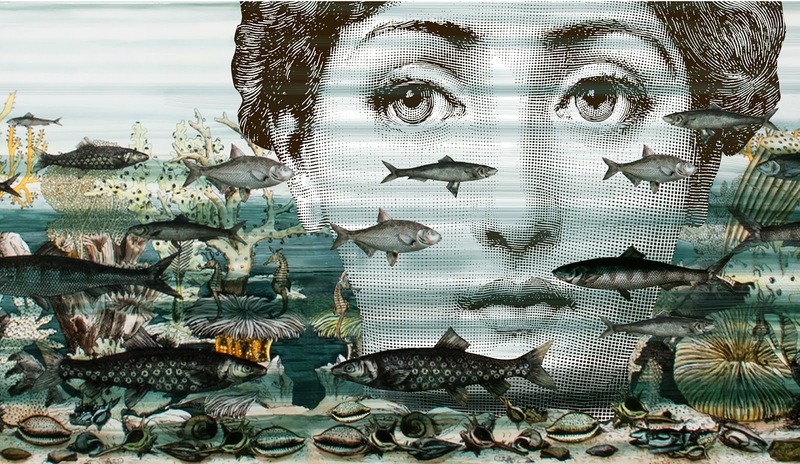 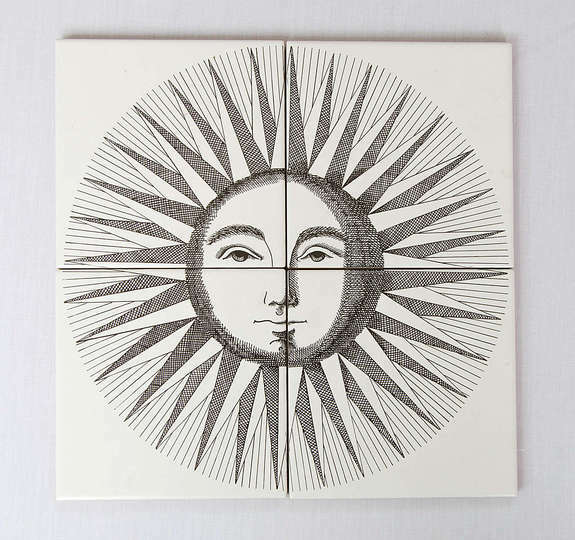 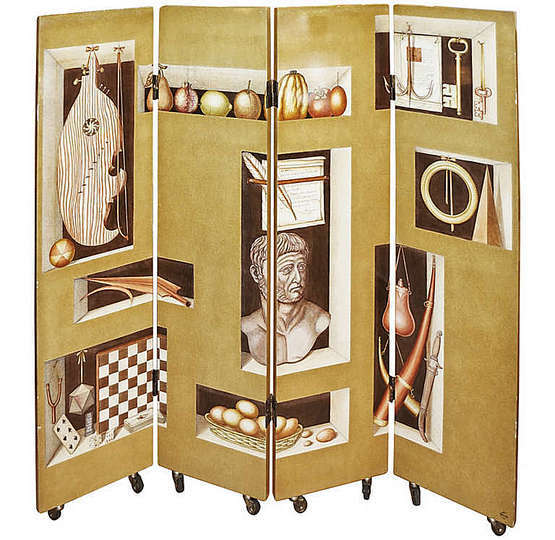 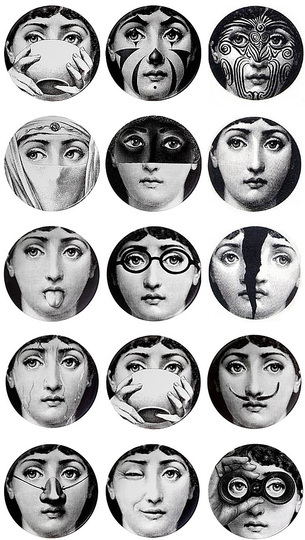 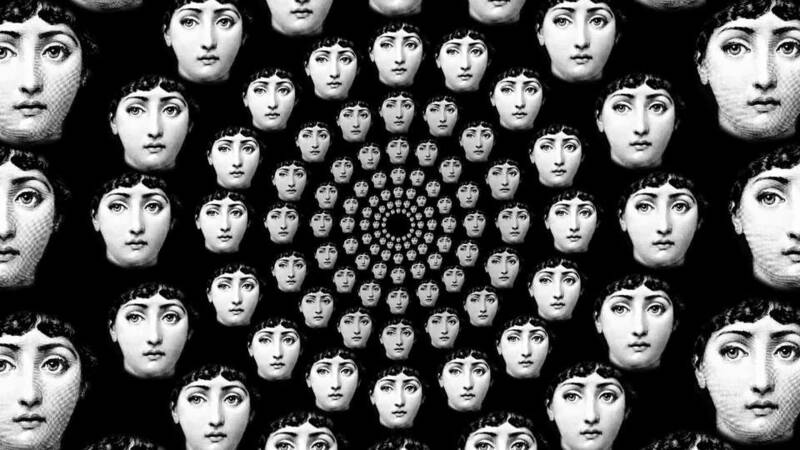 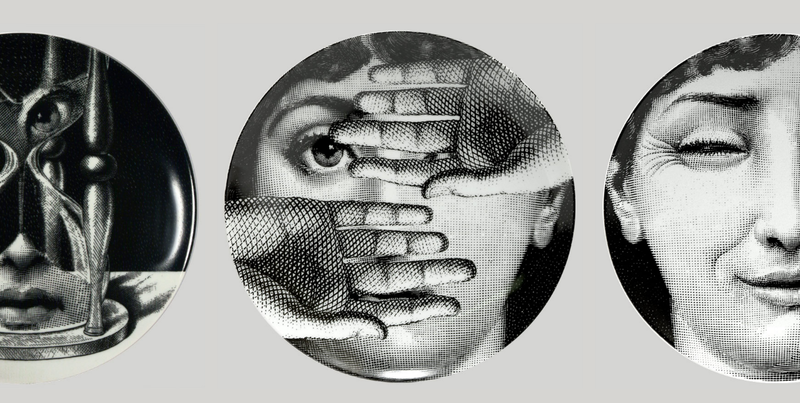 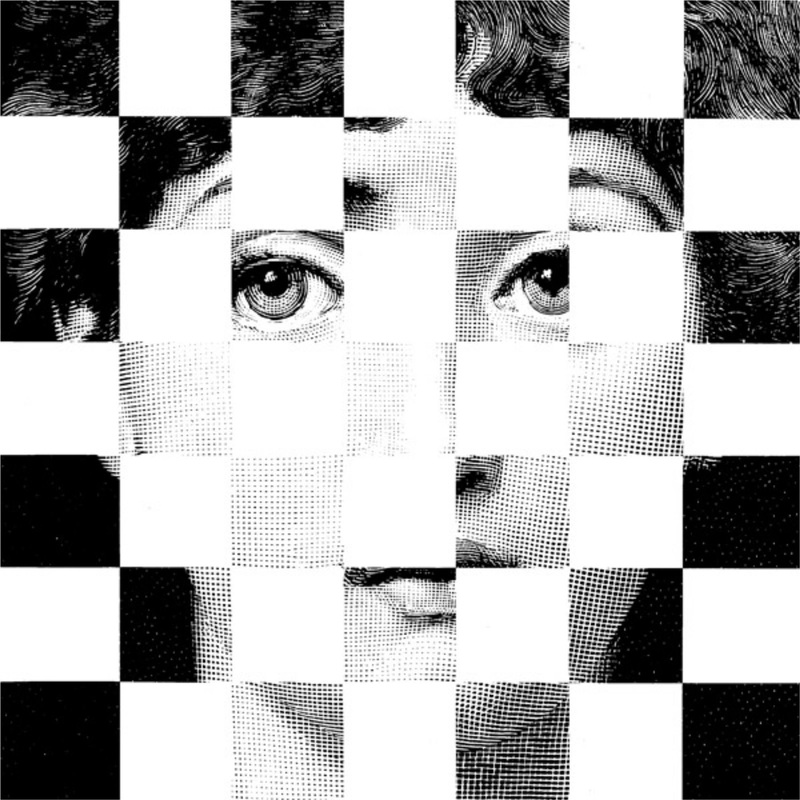 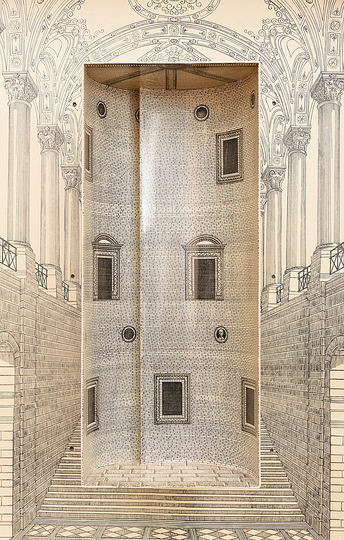 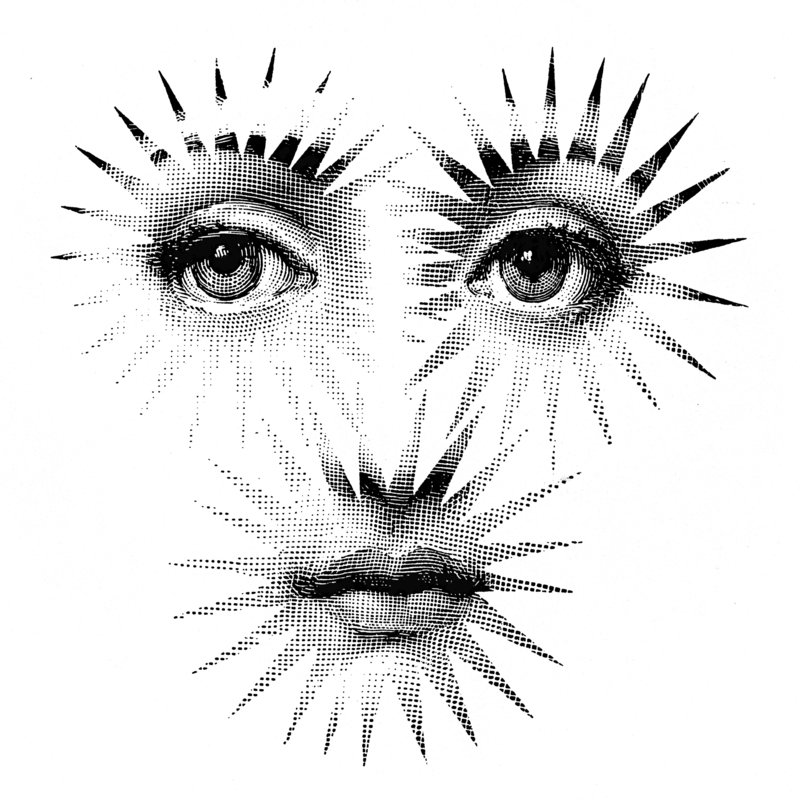 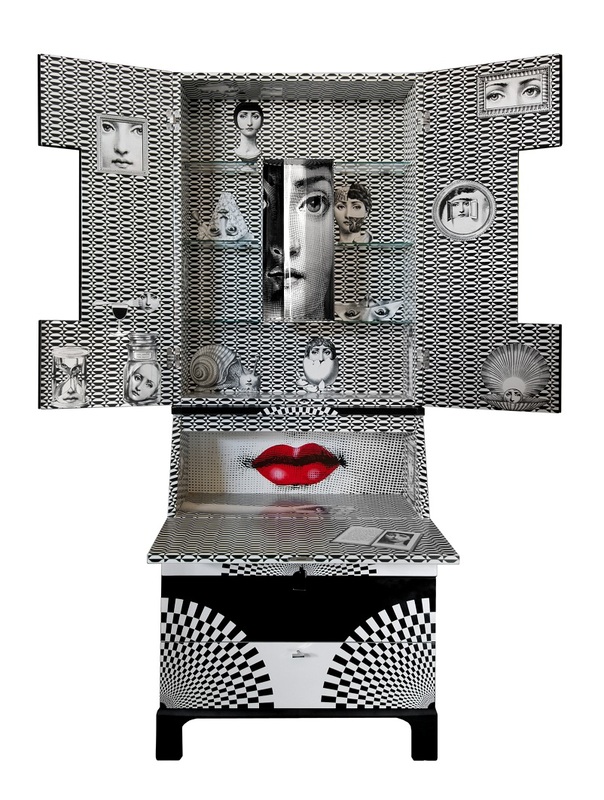 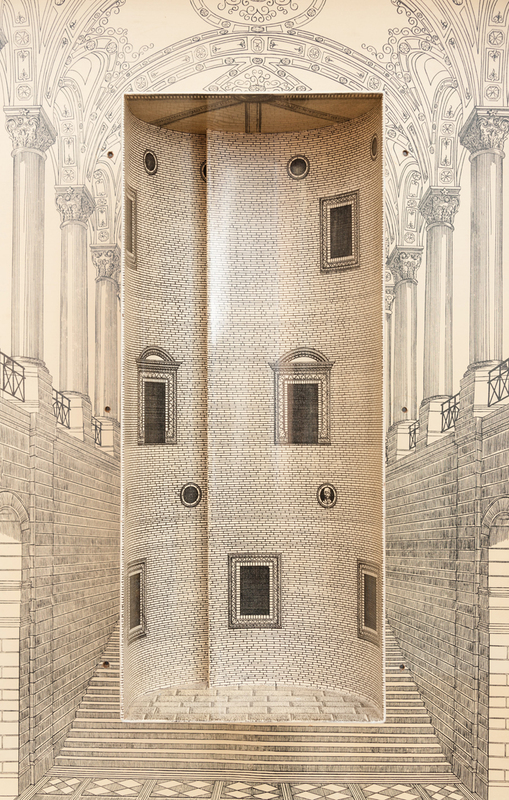 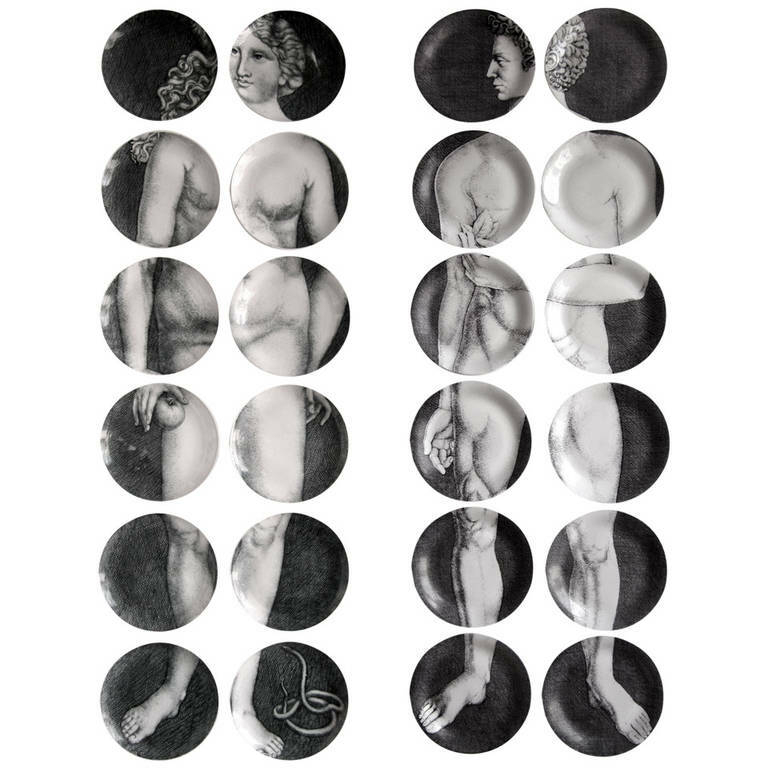 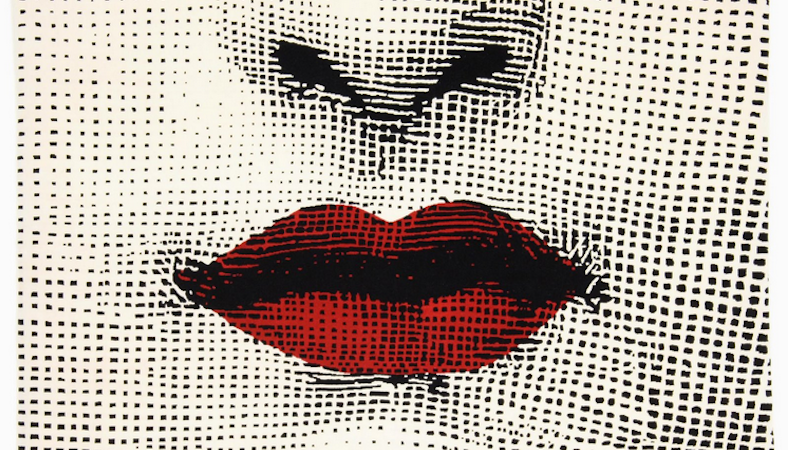 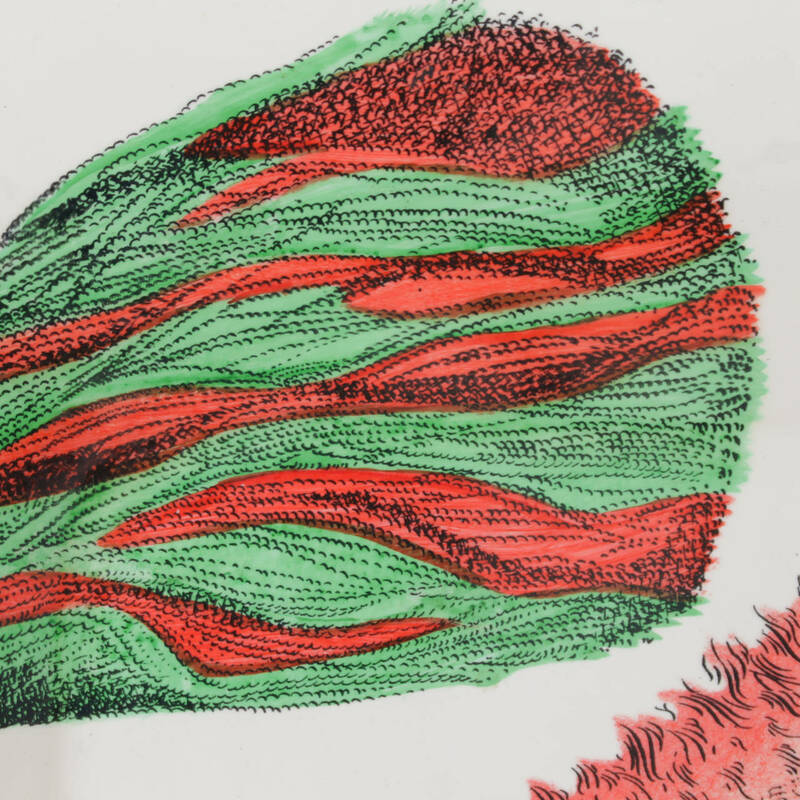 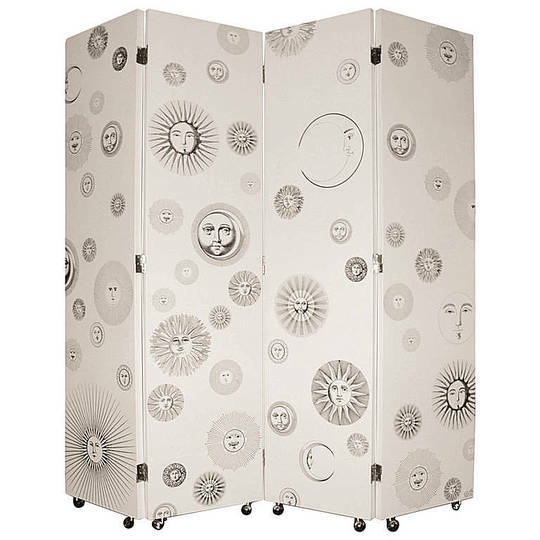 Piero Fornasetti, who did not know Cavalieri in person, said that her face inspired him because it was an archetype, a beautiful and classic image. 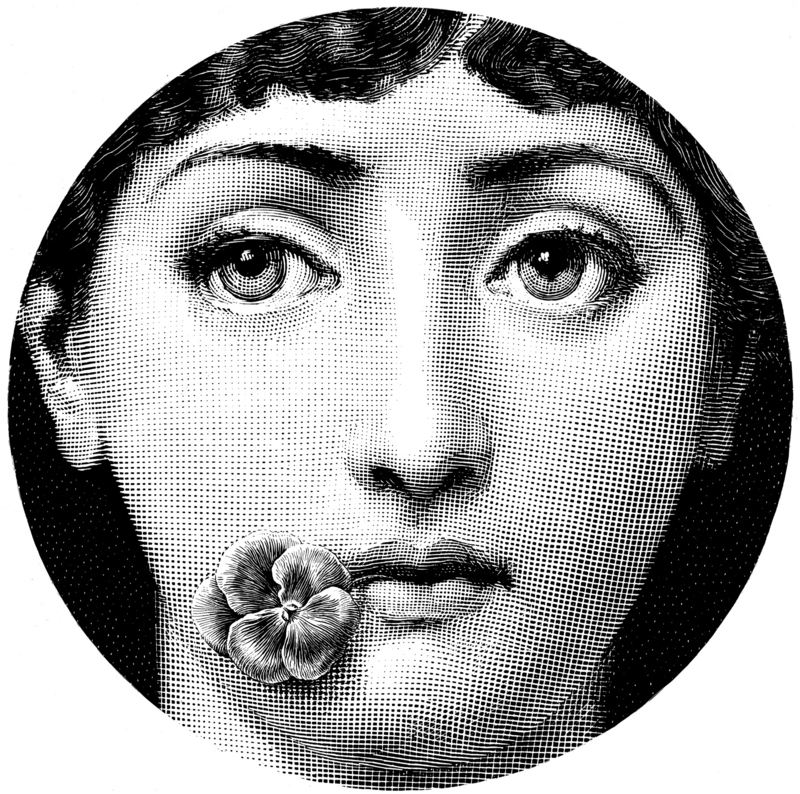 Born in Rome in 1875, Natalina Cavalieri, born into a poor family, worked as a flower girl. She started singing, was discovered by a café owner, and soon became a star at the Folies Bergère in Paris. 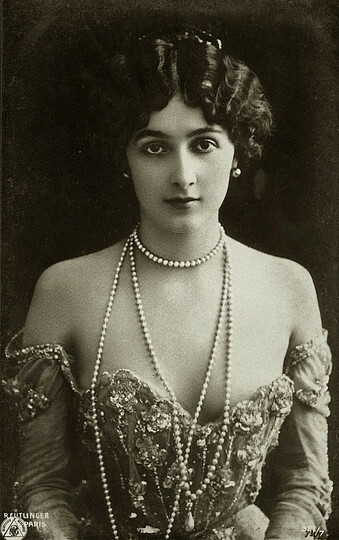 She got to know and married a Russian prince, Alexandre Bariatinsky, who paid her singing lessons with Mariani Masi, and eventually made a debut at the Theatro San Carlos in Napoli in 1900 at the side of Enrico Caruso. 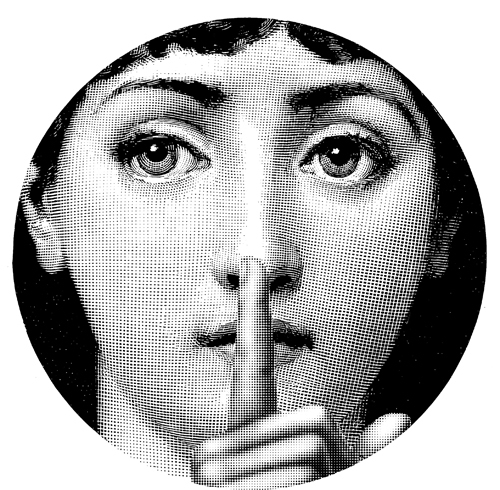 Her performance was not met with applause and she moved Lisbon, but was again met with disapproval. 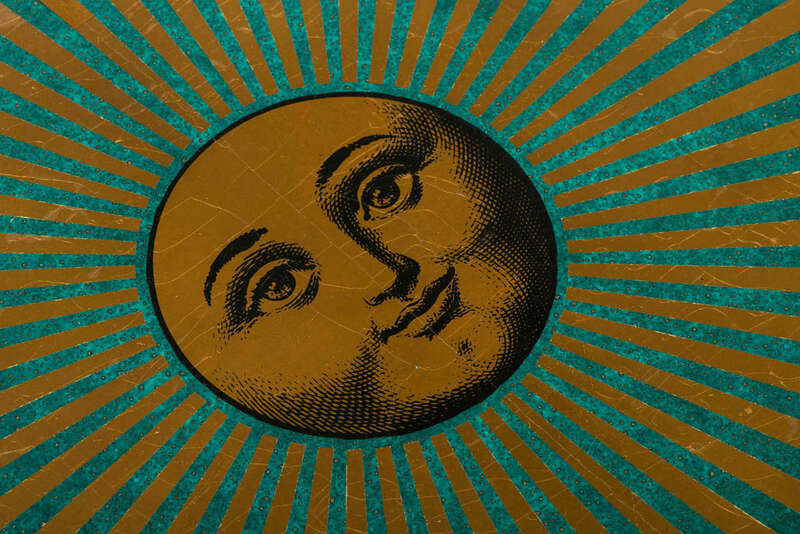 Her next appearance as Mimi in La Bohème was met with a warmer reception. 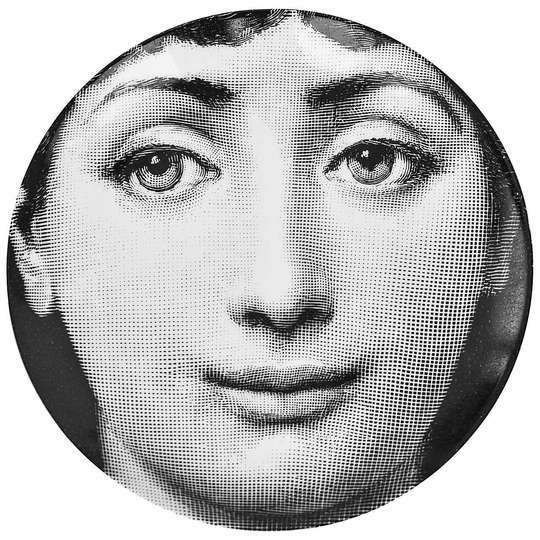 She sang Marguerite (Gounod´s Faust), Fedora (Giordano), Manon (Massenet), Tosca and Thaïs. Eventually she moved to New York, where she sang at the Metropolitan Opera and married the painter Robert Chanler, a member of the Astor and Dudley-Winthrop families. 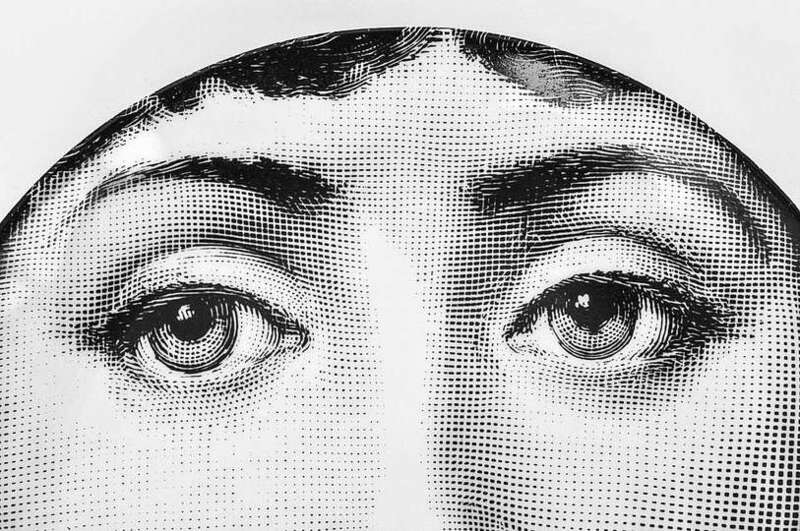 The marriage ended during their honeymoon, when it was discovered that Chanler had signed over his entire fortune to Natalina in a prenuptial agreement. 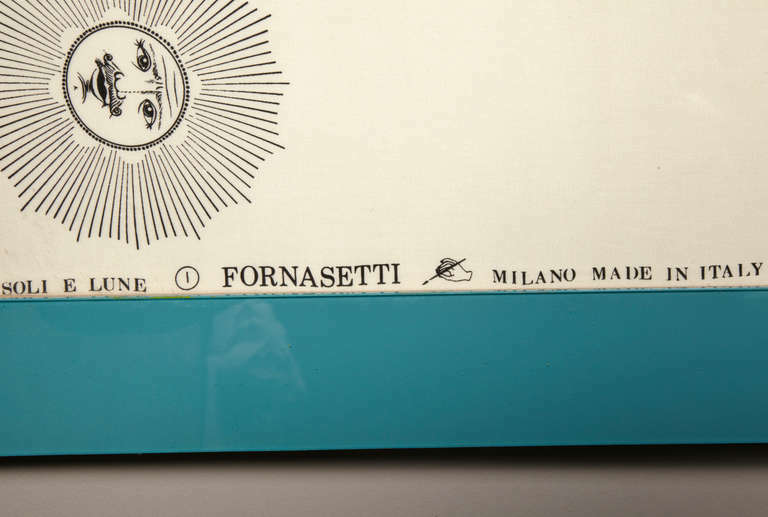 After an extended legal battle with his family, Cavalieri accepted a cash settlement of 80,000 dollars. 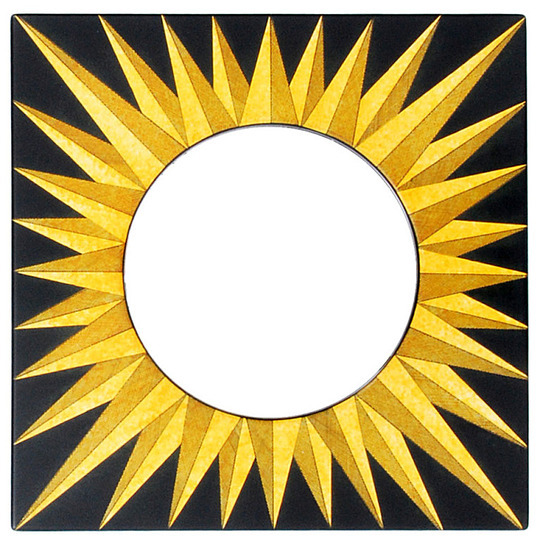 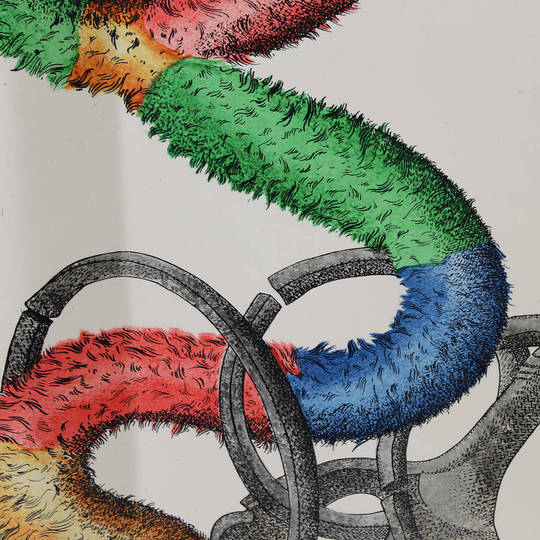 Robert Chanler was disowned by his family. Lina started a perfumery business on Fifth Avenue (which she claimed was based on secrets of Catherine de Medici), appeared in newspaper ads for Palmolive soap, and eventually moved back to France, where she opened beauty salons all over the country and in Monte Carlo. There, Natalina married the French tenor Lucien Muratore and made a series of silent movies, the first being Manon Lescaut, based on the a novel by Abbé Prévost. 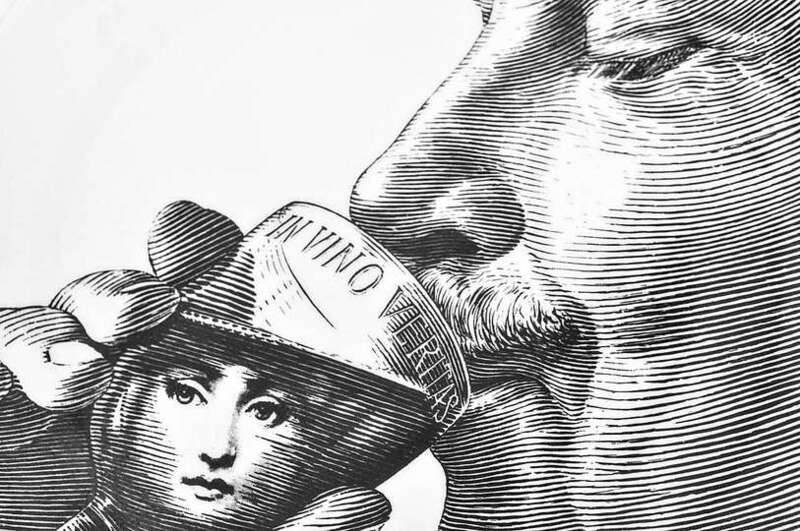 She eventually retired to her villa in Florence, by now divorced from Muratore, and married for the fourth time: Giovanni Campari, son of the Campari brand of aperitifs. 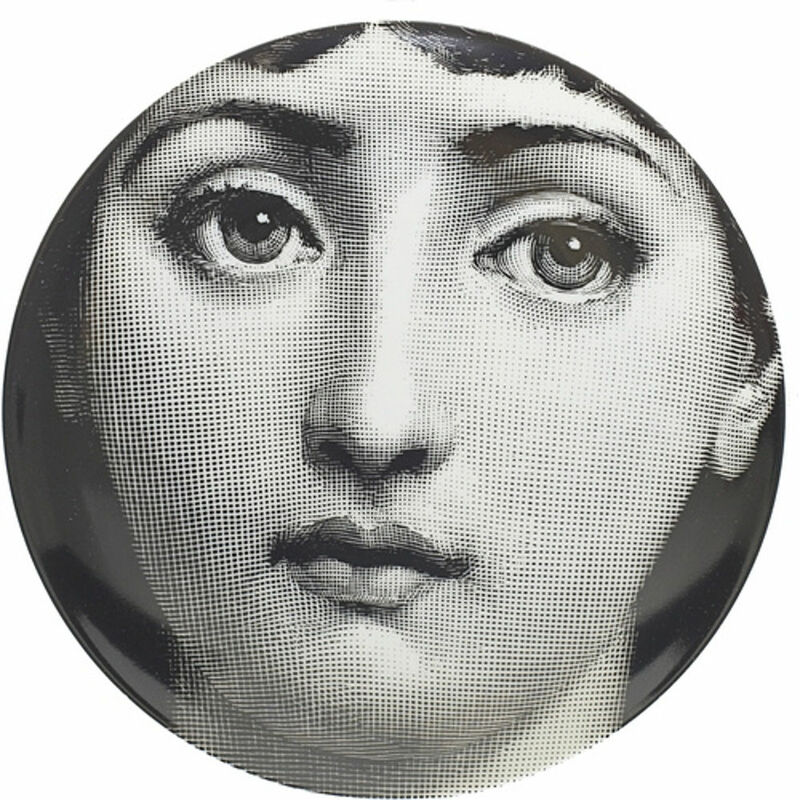 She was killed by allied bombing in February 7, 1944. The newspapers recorded that she was on her way to the air-raid shelter when she fatefully decided to run back to her villa to fetch her jewelry.